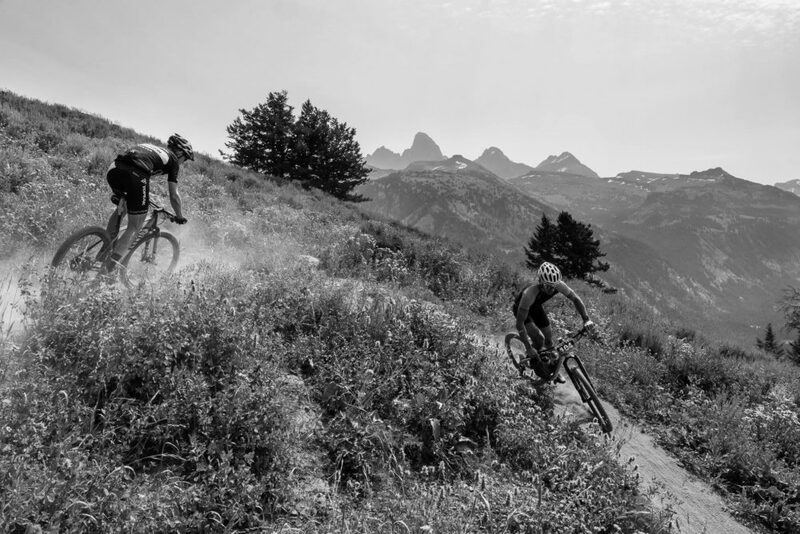 The next stop in the NUE series, Pierre’s Hole, is a rugged 32 mile single track loop that takes racers all over Grand Targhee Resort. If you’re able to look up out of the chest high wildflowers, the views down into the valley and of the Tetons at Pierre’s Hole 100 are breathtaking. At 7:00am on a beautiful cool morning, the 100 mile racers start their three lap race followed at 8:10am by the 100k racers and at 8:40am by the 50k racers. 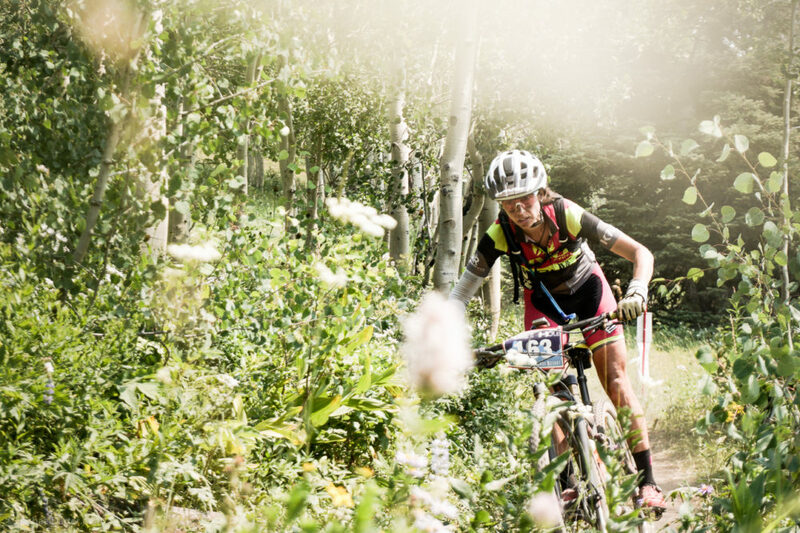 The race starts with a grueling 1700’ climb up the resort separating everyone for the 95% single track course. Once at the top, racers head down 38 special for a memorable descent with 38 switchbacks. Climbing back up the resort slopes again, riders enjoy an exhilarating high alpine descent down to aid 1 and back down to the resort base area. 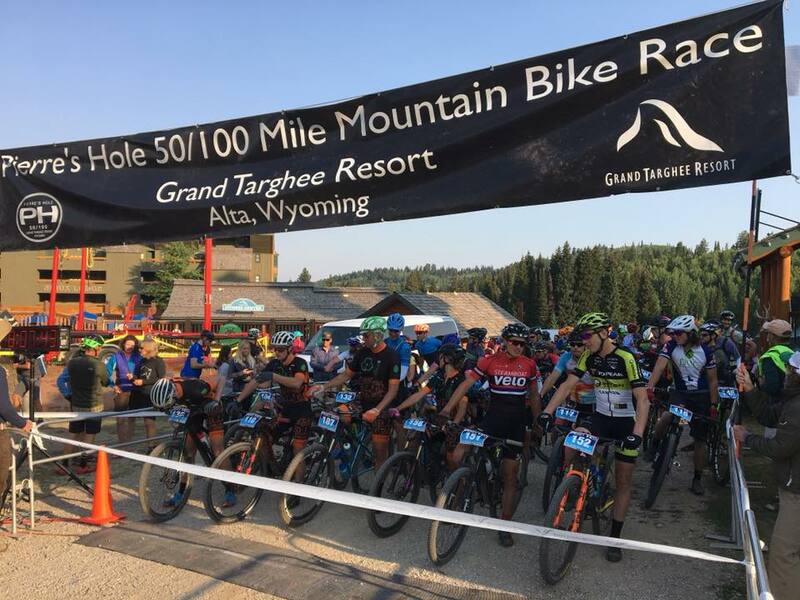 The next two loops are an undulating combination of meadows, forests, twisty and smooth single track that brings racers back to the start/finish for the end of lap 1.With temps in the low 70s, a race venue at Grand Targhee resort full of campers, hot showers, local beers, good food and kids activities as well an epic single track course; this is a race geared towards the avid mountain bike racers as well as the family-friendly and casual racers. East coaster, Bryan Lewis (Cutaway USA), proved he could handle the elevation and took the top step in a time of 8:00:01. “The Tetons have always been one of my favorite places to visit and I was excited to meet up with a couple friends from the area and take on the PH100. With 3 distance options to choose from the 100 mile field was a lot smaller than other NUEs. It’s as if others knew something I didn’t. The race started with a long climb that set up the lead group fairly quickly. On the first descent of the day Sam Sweetser set the pace and quickly separated he and I from the rest of the lead group. That set the tempo for the remainder of the ride as he continued to pull me around the single track. Sam was super smooth and fast on the switchback heavy course and it was fun to follow him along. He was riding strong and when he made a minor mistake in a corner I made my way around him and tested his legs a bit separating from him around mile 60 and never (and by never I mean always) looking back. He kept the gap tight but I was able to hold on and really felt good on the final lap in Rick’s Basin and had fun ripping on it. 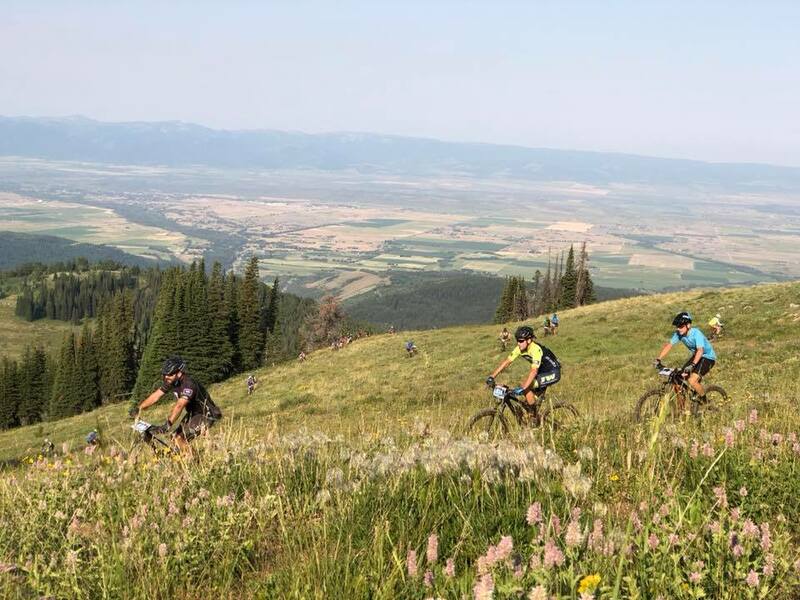 Overall, Pierre’s Hole was an amazing race under the view of the Tetons, which is hard to beat. I will say when I was finished I didn’t want to see another switchback for a few weeks, but that’s just me. Thanks Andy and the crew for building great trails and putting on a fun race! Twelve minutes back, Sam Sweetser (Cole Sport), takes second at 8:12:01. David Krimstock (Shimano/Pearl Izumi/Pivot) rounded out the podium taking third at 8:19:47. Conners gets fourth NUE win on Kenda Tires! 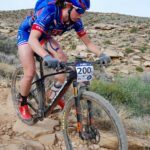 Taking the win in the women’s open division, racing on Kenda Saber Pro tires, Larissa Connors (Sho-Air CG), finishes in a time of 8:58:17. With this win Connors has a perfect score of four and now leads the overall NUE race series. “Pierre’s Hole was a last minute addition to my race schedule. I Choose to head up to Alta because I’ve never been to WY and heard so many good things about it! 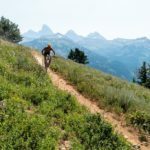 The idea of a three lap race was exciting, as was the promise we would be racing under the Tetons all day on SO MUCH SINGLETRACK! I tried to start easy, since the altitude meant pacing was going to be crucial. That didn’t last long though and by the top of the first climb I had been lured into riding super hard, and decided to just run with it. 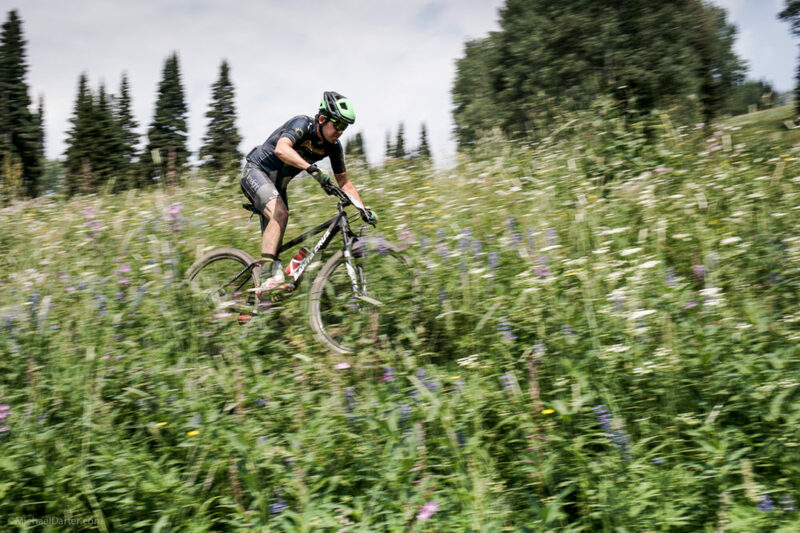 The 38 special descent was crazy fun on lap 1, and the flowers and scenery distracted me from any thoughts of how long the race was, or how much I was going to blow up if I kept going so hard. By lap 2 I had to slow down a bit. 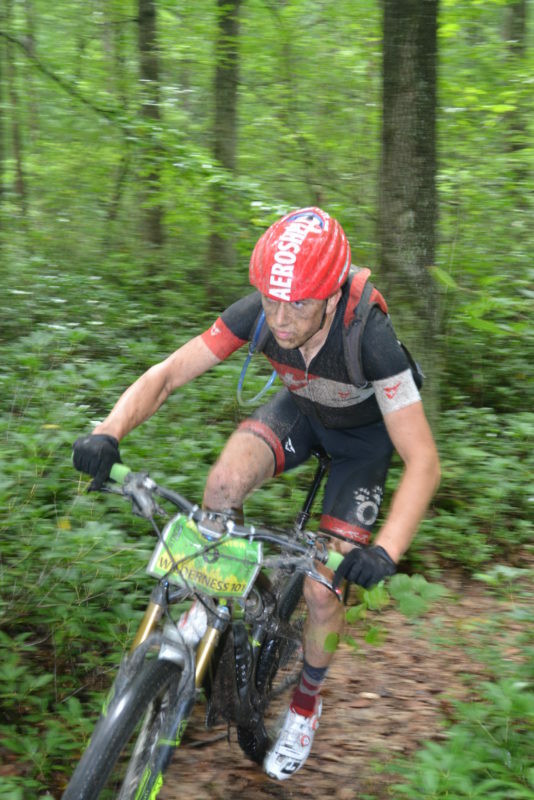 I realized when my wrists started hurting on lap 1 that if I didn’t actively choose to recover on the dh then I was going to be in a world of pain by lap 3, since you COULD pedal every inch of the course if you wanted. A volunteer told me that 2nd place was only 5 min back at the start of lap 3, which freaked me out since I was chillin’ on lap2, so I laid down the gas again on lap 3. Surprisingly it felt good to dig deep, so I pushed hard, had fun cheering on the racers doing the shorter distances, and ate all the BonkBreaker snacks I had on me over the course of the last 32 miles. Kaitlyn Boyle (Pivot Cycles/Industry Nine) finished second in a time of 10:06:59. Crossing the line third was Jennifer Wolfrom (Hoback Sports) at 10:49:59. Getting his first NUE win of the season, Henry Fischer of Wila’s Wheels, won singlespeed with a time of 9:23:15. Brent Cannon (Team Elevate), took second in 9:36:58. In a sprint for third place, Adam Smith finished just seconds before Adam Miller in a time of 10:32:05. 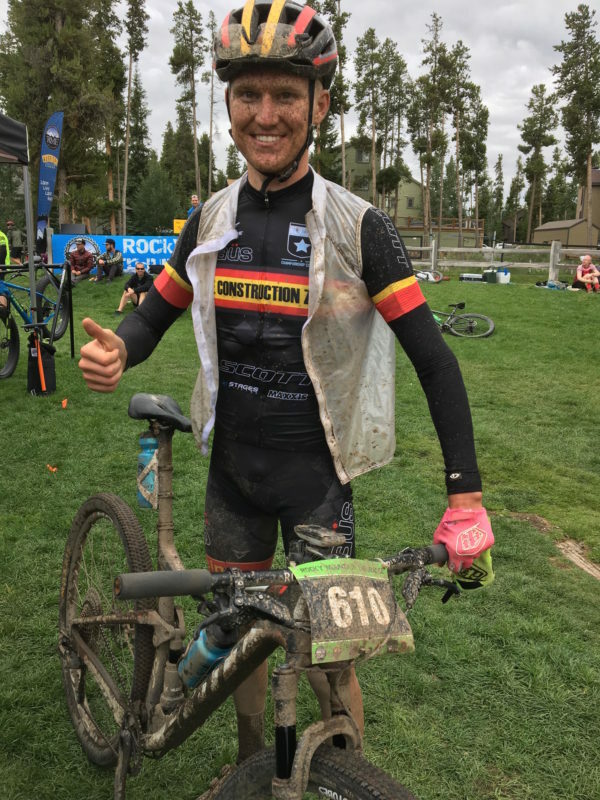 Adam Miller states, “I am a mtb coach for our local NICA racing teams, Teton Valley Composite, and Jackson Hole Composite, so a shout out to them!!! The younger kids were supporting at aid stations All day! We had four of our athletes compete, and one of them podiumed in the 50K open! I had only 2 rides over 4 hours prior to race, so the hundred miles was more of a challenge to say the least, and a good lesson of perseverance for our athletes’. I chased another single-speed rider all day. He would DROP me on any hill handedly. I relied on my downhill skills any chance I could and would get him into view every once in a while. I got a glimpse of him in the last 10 miles, so I gave-er everything I had. He did too! I finally caught up with him about 100 yds from the finish. Sprint finish, and I won by .3 seconds! With wins at True Grit, Tatanka and High Cascades, Cary Smith (The Hub) can now add Pierre’s Hole to the list and finished in 9:02:12. He now leads the NUE masters race series with a perfect score of four. About ten minutes back was, Matt Woodruff (Kuhl) taking second in a time of 9:11:56. Mike Baughman (Lost River Cycling) took third in a time of 9:57:52. Located in the beautiful Carrabassett Valley of Northern Maine at Sugar Loaf Ski Area, The eighth annual (CBCC) Carrabassett Backcountry Challenge 100k joined the NUE Marathon Series in 2017 witnessing tremendous growth. According to race director, Warren Gerow, “the event has evolved a lot since 2011 when the 100k was a two lap course that was stitched together with mostly old single-track and double track. We’ve seen tremendous growth in the past few years; 2015 187 people registered online, this year, the race has grown to about 500 racers.” In addition to the NUE 100k distance, CBCC also includes shorter distances of 50k and 25k plus kids races. 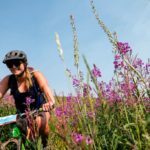 During the past seven years, approximately $750,000 has been spent building mountain bike trails in the Carrabassett Region. 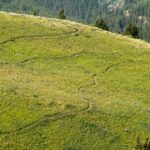 The goal is to construct an iconic mountain bike trail network that is on everybody’s “must-ride” list. To date, there is approximately eighty miles of riding for all abilities. 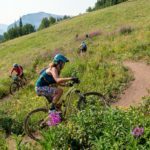 This includes miles of super flowy, machine-built singletrack and old-school style trails that have been carved out with hand tools and sweat. Profits from the race go towards construction and maintenance of new trails. Crystal Anthony, Liv Cycling, won the Women’s race finishing in 5:44:59, her first NUE win of the season! 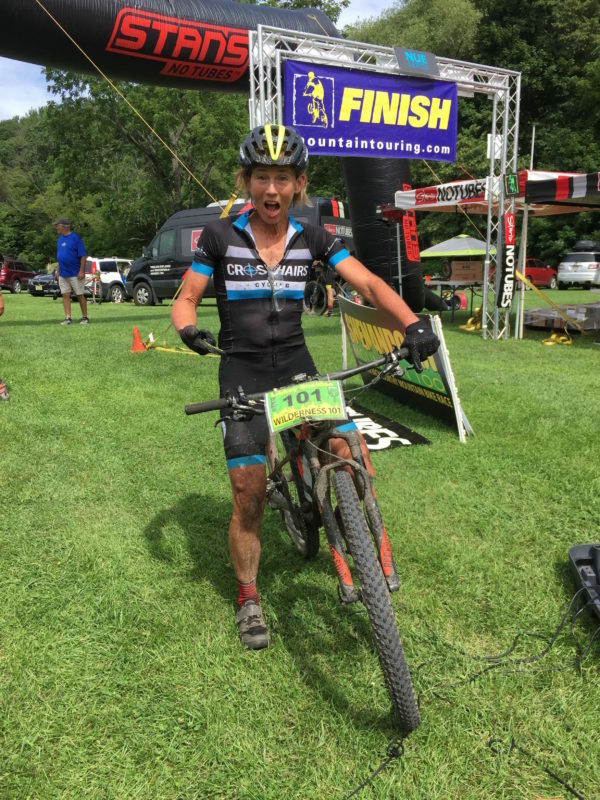 Following her second place finish at Cohutta and her first NUE win at the Mohican 100k this spring, Lara Richards, Little Fire Cycles, finishes second in 6:11:19. “This year has been a great year of racing for me. I have really enjoyed doing the NUE series. It seems that every race the weather has been wonderful and each location seems to be more beautiful than the last. However, since having to DNF due to a mechanical at Damascus, I was definitely not going into the Carrabassett Challenge with much confidence. And after the 20 hour drive from Georgia to Maine, I was contented with just enjoying my race, doing my best and finishing where I may. 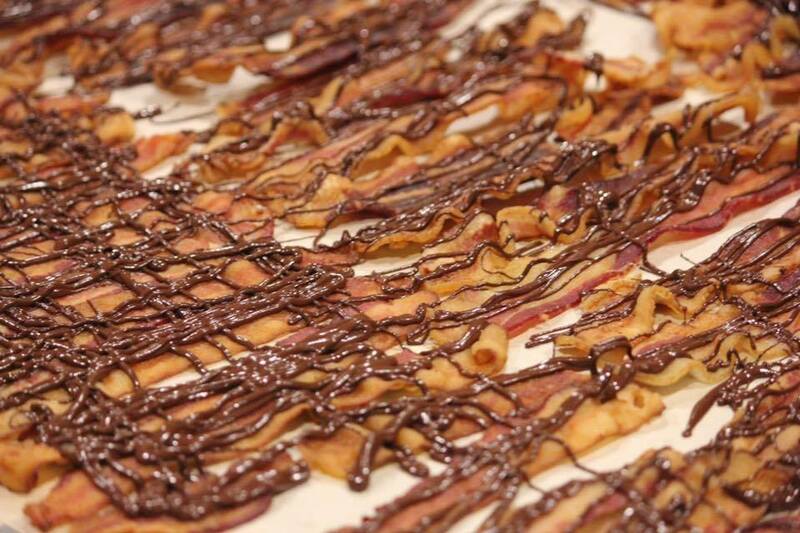 Bacon with chocolate drizzle to power riders on course. At the start of the race Kaitlyn and Crystal both took off fast and I thought I was sure not to see either of them again. I was not too far along when Bryna passed me strong on a climb of rocky switch backs putting me in 4th. I was able to keep her in my vision for the first 18 miles or so and was able to pass her, while charging down a steep downhill. But not for long, she passed me back soon after and this time I was not able to keep up. At this point I found myself riding with the same group for several miles. I road chill and paced myself accordingly. I did not think I would make it onto the podium. But even still I was having a crazy fun time on the trails and the ever changing terrain. Even if I finished last, I would not have regretted this race at all. The Carrabassett Maine trails offered a more challenging course than I expected and kept me engaged throughout. I enjoyed the twisty sections, moving in out of the rocks. I enjoyed getting to ride up the Widowmaker to and through the ski resort. There were longer and steeper climbs than I anticipated. The downhills were also a blast and so much of the single trek was fast, fun, and flowy. I was picking up speed in a level area of single trek, just enjoying my ride, when I noticed a female rider ahead of me. I could not believe it! I told the male rider just in front, “to the left”. I was going to catch my competition. At that point, the race became a race to me again. I was off and was able to catch and pass Kaitlyn before exiting that section of single track but I knew I had to keep pushing. I could tell she was a strong rider and knew if I slacked off at all she would be right on top of me. I think I was able to put a little distance between us after a long climb through a clearing. After this came Birthday Hill which I bombed down fast as I could and it was here I unknowingly passed Bryna as well. She road in behind me from the aid station from on top of the hill. I only noticed her as we exited on to the gravel. She got in front of me at the u-turn and, from there, we road together for many miles passing each other now and then. 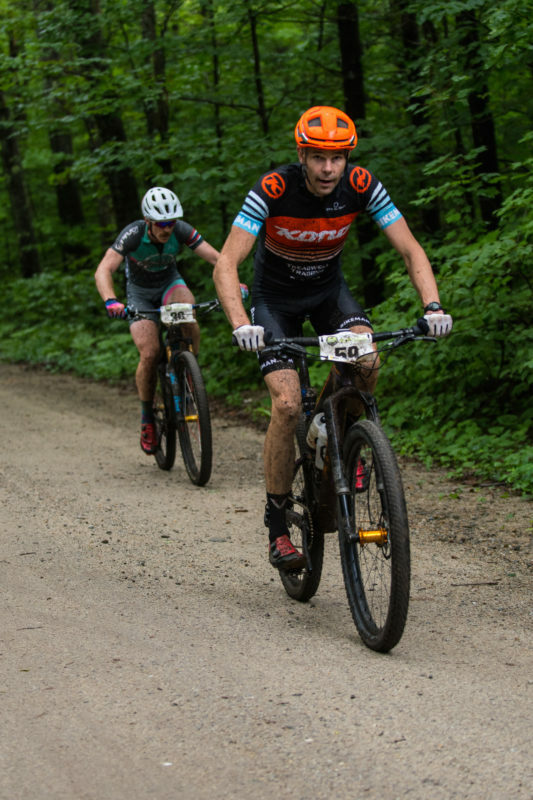 I still, at this point, thought she would get away from me before the race was over and I would finish third but I was able to break from her after a short stretch of gravel and then the last climb of single track switchbacks. It was hard for me to keep a decent pace at this point, I was getting very tired and was waiting for her sneak behind me. I gained some speed on some fun downhill which was a nice break and helped push to finish the race and take the second spot. I did not see Cathryn at all during the entire race and I am proud to finish second to someone so strong. I am also grateful to be able to race with such amazing female athletes as Bryna and Kaitlyn. Four minutes later, last year’s race winner, Bryna Blanchard, BMB Racing, was third at 6:15:06. Blanchard is a top contender for the NUE Marathon Series title with second place finishes at both Mohican and Iron Mountain this year. “Another fantastic NUE race happened last Saturday, this time in the Carrabassett Valley wilderness of Maine. The weather and trail conditions were perfect, much different from last year’s mud and pouring rain on the start line. The level of competition had also taken a step up from last year. Two very accomplished women from the west coast, Crystal Anthony and Kaitlyn Boyle, pushed the pace from the start. I love racing this course, the constantly changing terrain, long climbs and descents keep me engaged and distracts from the exhausting number of hours it takes to complete. 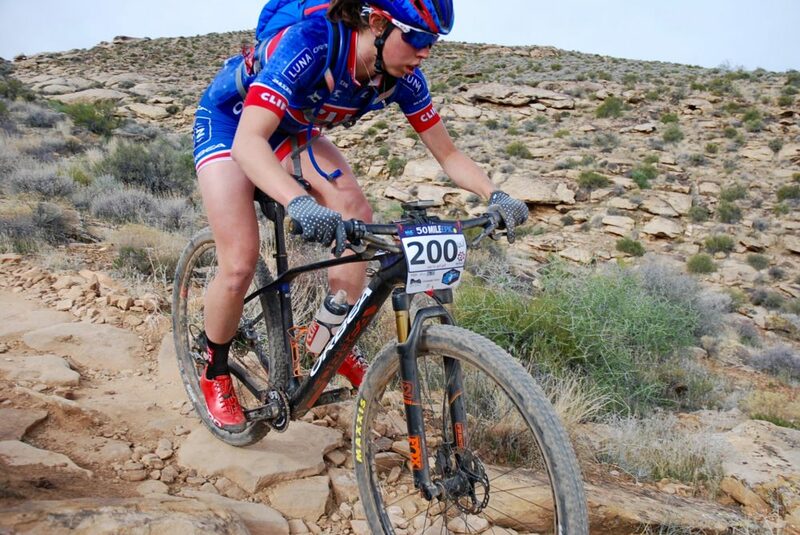 I raced hard and felt good, passing Kaitlyn on the long exposed midpoint climb to move myself into second. Super strong Lara Richards and I rode together on and off, trading places back and forth for much of the race until she dropped me for good and rode away on the final long double track climb. The highlight of my race was riding with Lara, trying to capitalize on my strengths and minimize my weaknesses to stay ahead or in contact with her. Not sure if I went out too hard or didn’t fuel properly but the last five miles were absolute survival, suffering and going nowhere fast. 2018 Marc-André Daigle wins, setting a new course record! 37-year-old Marc-André Daigle, Garneau/Pivot Cycles OTE Canada, was first overall, earning his first NUE win completing the 100k course in 4:54:15, setting a new course record, the first racer to finish sub five hours! 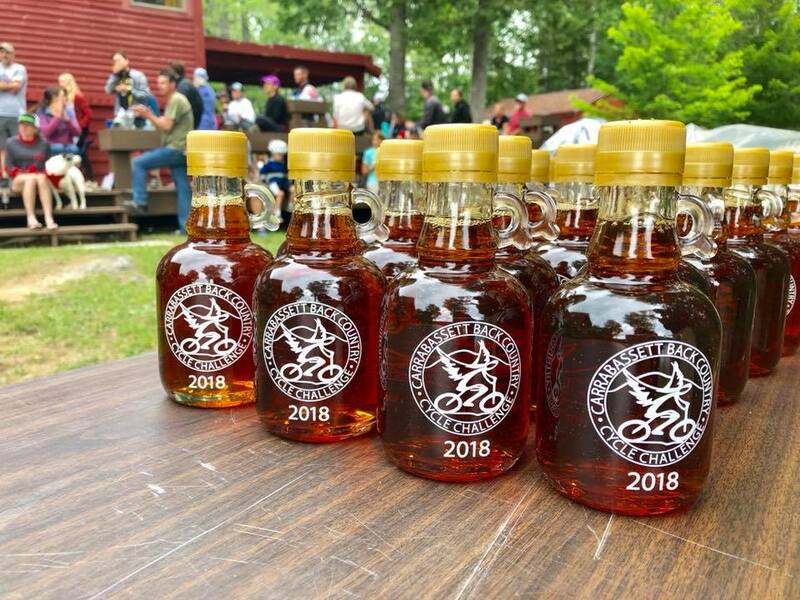 Custom syrup bottles for race finishers! Four minutes back, Mathieu Belanger-Barrette, Pivot Cycles OTE Canada, gets second at 4:58:03. 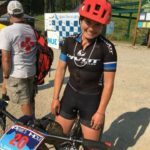 “I wasn’t expecting such a fast start especially knowing that we were about to shred singletrack for 5+ hours. The pace was sustained and even exaggerated for a while and we finally got settled around km 60. Marc-André and I were in front and we couldn’t see the chase group. I was starting to see double when Marco pulled a big attack. It was way too much to handle. As I tried to catch him back, I clipped my pedal on a hidden rock and crashed quite hard on my ribs. Two minutes later, 2017 Race Winner, Andy Scott, Riverside Racing, took third at 5:00:08, sixteen minutes faster than last year. 2018 Kramer wins the SS Race! Shane Kramer, Placid Planet/Barkeater Trail, won the Single Speed race to finish 5:35:29. 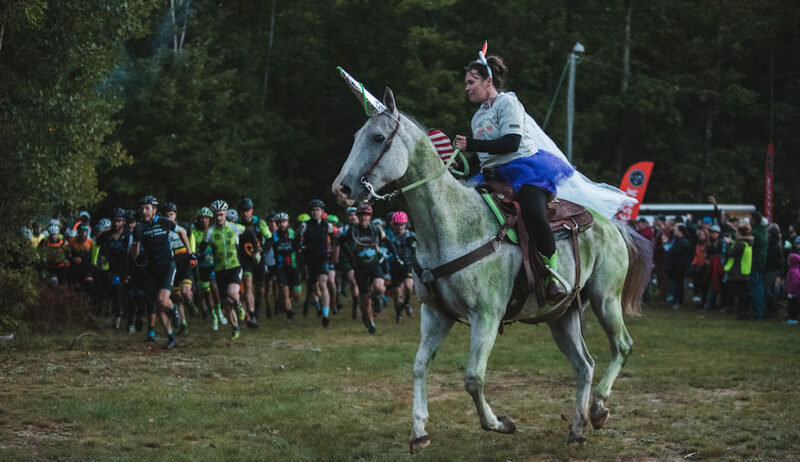 “After hearing several of my friends talk about how great the riding was in Carrabassett Valley, I knew I had to add this race to my calendar. I’ve always been a slow starter and showing up to the line late didn’t help me any this past weekend. I was probably in 100th place leaving the start and maybe 80th by the time we hit the tight singletrack. Patience was the name of the game while I waited for every opportunity to pass. As we got to the condos on Sugarloaf I heard someone counting off riders as we went by “…48, 49, 50…” making up ground but still a long way to go. I finally caught up to a group with Peter Bradshaw and Matt Sousa just after the 1st aid station on the climb up Buckshot. I was racing on a borrowed frame from Solace Cycles that I just built up on Wednesday before the race. The frame fit and rode great but didn’t have any water bottle mounts. I don’t like riding with a hydration pack so I only had one water bottle in a fanny pack. This meant I had to stop and fill bottles at every aid station. Not the best race tactic. I yo-yoed for quite a while with Peter and Matt. Matt told me that Doug Thorp was still up ahead somewhere. I don’t know Doug but heard he was a strong racer and figured he had 1st place already wrapped up. So, after finally getting a gap from Matt and Peter, I was pretty surprised to come up behind Doug a couple of miles before the 3rd aid station. I made a pass but he passed me back as I stopped to fill my only water bottle. I caught and passed him again on the fast gravel out and back section. I think mainly because I was pushing a bigger gear, 34×19. This section also allowed me to see that Peter and Matt were still right there. So, although, my legs were showing signs of cramping I tried to keep the pace up and decided to skip the water refill at the last aid station and push through to the finish. I’m so stoked to come away with a win at such a great event. Three minutes later, Doug Thorp, Colonial Bicycle Company, finished third at 5:42:21. “To fully understand why I ended up on the podium you need to understand two things; I’m addicted to cycling and I’m broke. 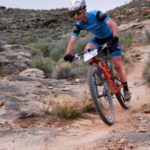 This was my second NUE single speed race, and truly my third SS marathon mountain bike race ever. 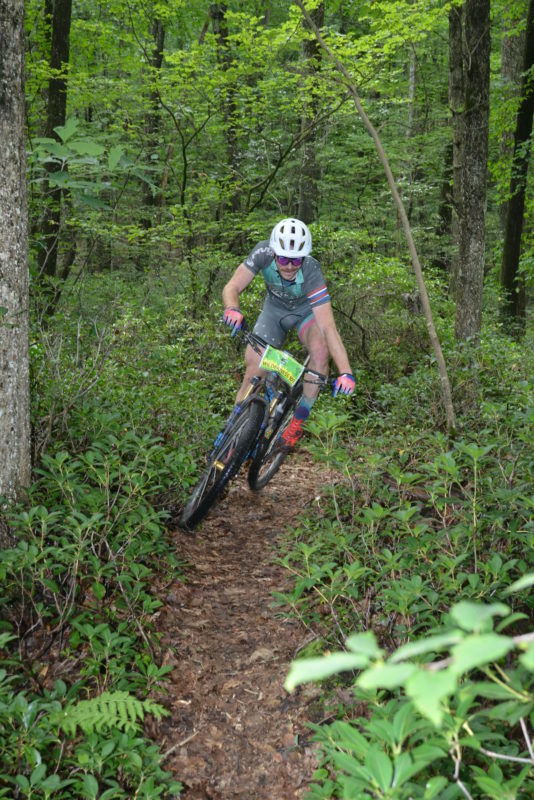 My journey began in Pisgah in April where I was JRA and ended up bashing my carbon wheel and squishy bike just days before Big Frog for which my girlfriend was registered and I was still only toying with the idea. With my squishy bike in the emergency ward, I only had one option. I had to race my cobbled together SS which was an old On-One 456 26” setup like a dirt jumper. So with the option to race Open off the table I was more inclined to race but still unsure if I was up to the task of slogging for 65 miles in Tennessee. I did some reconnaissance the day before with a few friends who had flown in for the race and felt it was within my ability to finish. The race started slow and ended well with me getting stronger throughout and moving from 13th to 7th in the last 10 miles. I ended up losing a sprint for 6th, but was elated that my first marathon SS race went so well. The only question I had was could I do better? I was hooked. Brimming with confidence I registered for my local race the Carrabassett Backcountry Challenge knowing full well that this race was full of both Backcountry and challenges. My race morning got a little thrown off since I had forgotten my 2toms chamois sheets; I was desperately searching for anything that would keep me from destroying my undercarriage. I found my Shimano bleed kit in my trunk and slathered on some green mineral oil and was hoping for the best. I rolled up to the starting line late and found a friend that let me squeeze in. He told me he just applied his own sheet, and was worried his hands were now too slippery to hold his bars. “5 minutes to start.” ~Announcer. I sprinted over to his car and went full sloppy seconds on his 2toms sheet, rolled back to the start line at peace and waited for the gun. Right there my race was saved. “Bang” we were off! The first couple turns are important at every race but hitting that single track before the rest can save you minutes in the overall. I fell back to somewhere in the high 30s or low 40s before making it to the first real climb. After the first 10 miles I was only 6 minutes back on the open leaders. I was feeling great and kept just spinning up the climbs and letting her buck on the descents. I was sitting in the 20s overall and was really feeling the flow. Across the 30k mark at the aid station I was told I was in the lead just before heading out on the 5 mile climb. I felt strong and was forcing myself to keep up on my nutrition. Greg Jancitis who was recovering from an early mechanical went by me on a power section like a freight train. I was baffled by his speed; he was kind enough to let me know I had a solid lead over the next single speeder. Little did he know I was four miles away from the “Lake Placid Kid” (aka Shane) from blowing my doors off. The course had some great water crossings and the last one had an un-rideable log at the top of the bank which was about 4 feet wide. Looking back and watching four riders hurdle the log and seeing the absence of a rear derailleur on one was disheartening. It was now a race or so I thought at the time. Shane and I rode together for the next few miles until I went past him at the aid station. Shane quickly filled a bottle and gave chase. The best and worst part of this course is around mile 44. It’s an out and back power section on a dirt road, where you can see 5 minutes ahead and 5 minutes behind you. As I found out the hard way my cadence of 120 couldn’t match the gearing and legs of Shane. I then was doing damage control wondering if all these other hammerheads that saw me spinning my wee little legs could see how much I was hurting. Turns out one other did and also had the legs and will to do something about it. Bradshaw caught me after mile 50, somewhere in the willywacks on some OG single track. For the most part I kept up to him, until I didn’t. I had one last trick up my sleeve, a trail called Crommet’s which is a half an hour climb at mile 60 (Yeah, 60! If you’re quick at math you’ll realize this was not as billed; a 100k.) I kept going the best I could with will and legs starting to fade I finally hit the last aid station just before the climb and started pushing my way by the masters racers up Crommet’s. At the top I was truly hurting with my stomach turning sour, my Garmin reading 65 and my legs all but spent. Heading down Oak Knoll, a heavily armored trail which I did my best to vibrate my way down, I didn’t manage to catch Bradshaw and believe he stayed strong. 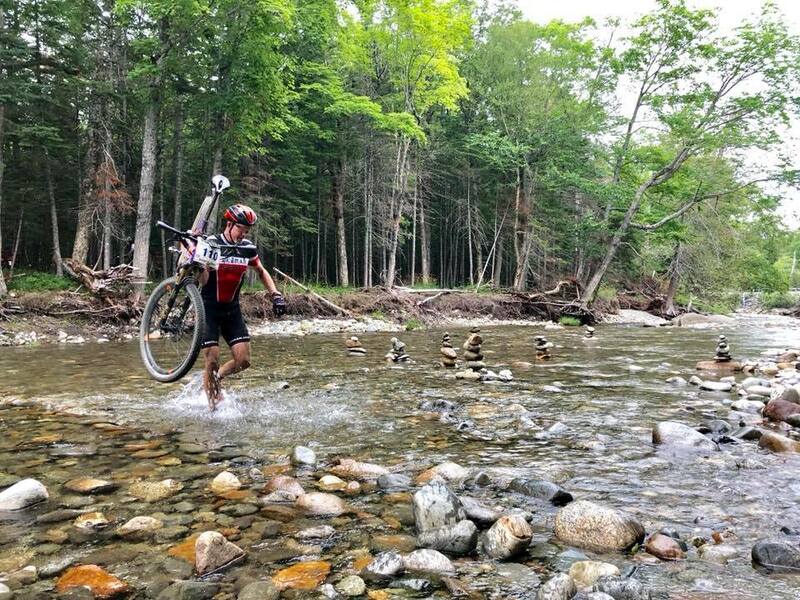 The last piece of this course has you cross the mighty Carrabassett River via a small footbridge. However this year’s big spring storms took it out and we were forced to ford the Carrabassett on foot. 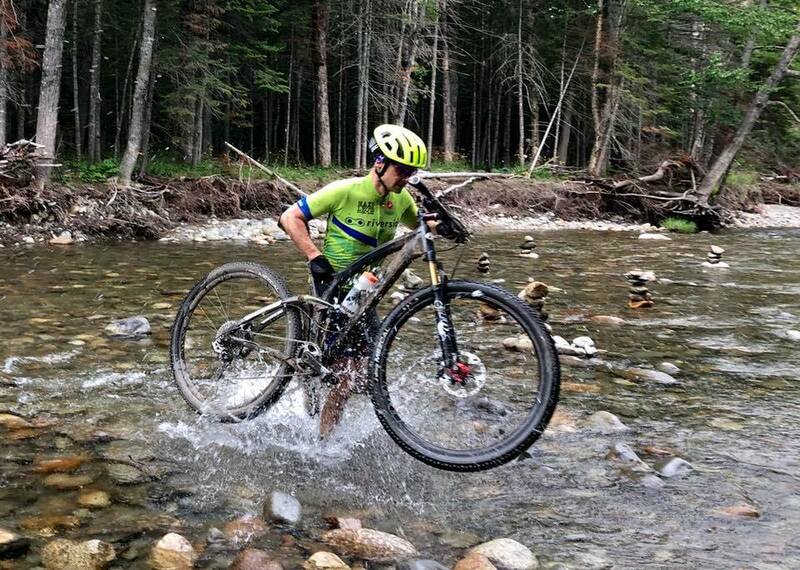 Running with my bike in knee deep cold river water was the highlight of the day. I finished better than I could have hoped and raced my hardest with limited mental mistakes. If you’re not from around here and want to disprove the local colonialism “You can’t get there from here.” Mark your calendars for the hardest NUE in the Northeast. Golet gets his first NUE Win of the 2018 Season! 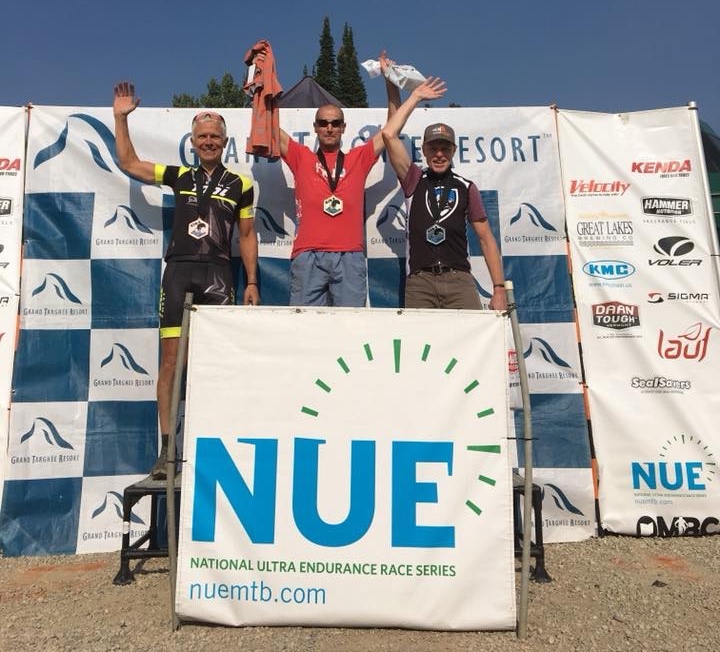 NUE Epic Series Champion, Greg Golet, Team Chico, earned his first win of the season now competing in the NUE Marathon Series. Golet completed the 100k course in 5:34:26. “This trip was a homecoming of sorts for me having spent many of my vacations as a kid alpine skiing at Sugarloaf and hiking in the Bigelows. And with my mom still living on nearby Eustis ridge, the race was the perfect excuse for a visit. The plan also made sense for my brother and best childhood friend who came from Alaska and Colorado. I’m terrible at pack starts and group riding in general, and had a pretty bad start jamming a stick in my derailleur trying to pass in a brushy area, and otherwise wasting energy being spastic when I should have just been patient and waited for the course to open up. On the first sustained climb I got past my friend/rival Jeff who I’ve battled with the last couple years in the Epic series. After traversing the resort we hit a section of steep narrow trail where a wrong line choice sent me flying over the bars. My bike cartwheeled, but somehow I landed on my feet. With no apparent bike issues or injuries I was able to ride on. All day I was blown away by the varied terrain and trail conditions. Coming from dry California, it felt so good to ride in the moist forests. On the out and back I saw Jeff was riding fast with a group just a few minutes back, and so kept pushing, skipping aid stops even though I was low on water and out of food, but then wondering if the little bits of time I saved would be lost from slowing down if my intermittent leg cramps worsened, which didn’t seem unlikely given how dehydrated I was. But on the last long climb I felt good, and the oak knoll descent was pure joy. However, at the bottom I relaxed too soon and went off course. Luckily a guy not far behind me figured it out quickly and soon we were back on track. Before the race started, the guy who set up the course welcomed us there “as family”. That resonated with me, and I felt lucky to have so many friends and family there to share the experience with. 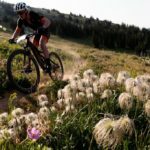 Maine rocks, and it’s awesome to see such a vibrant and quality mountain bike scene developing in Carrabassett Valley. Three minutes later, 2016 NUE Epic Series Masters Champion, Jeff Clayton, Georgia Neurosurgical Institute, now competing for the NUE Marathon Series title, finished second at 5:37:21. “My wife Jodi and I arrived at Carrabassett Valley on Thursday afternoon after several days of spirited hiking in Cape Breton Island Nova Scotia and Acadia NP. I was looking forward to riding some rugged trails, but unsure how my tired legs would do. 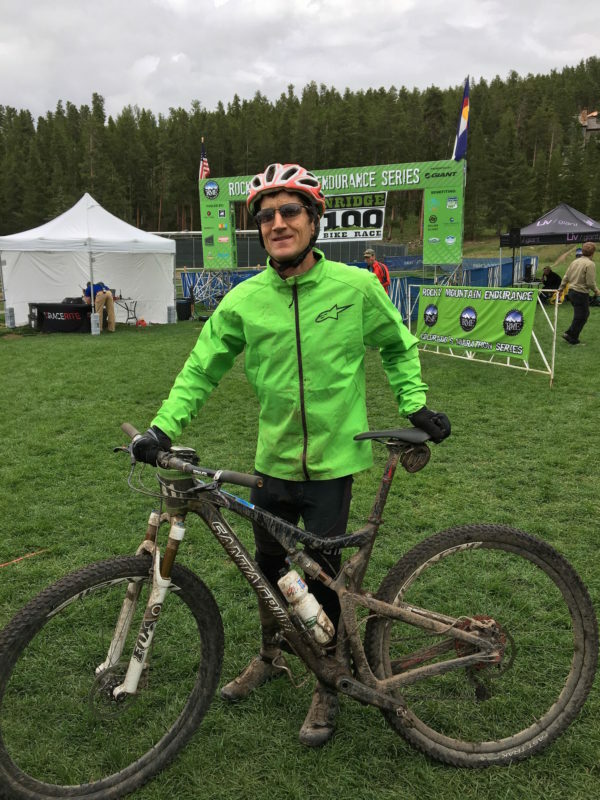 My potent rival, Scott Burrill, graciously offered to share his slope side condo minutes from the race start….it is not at all unusual in mountain bike racing for the fiercest competitors to become great friends. 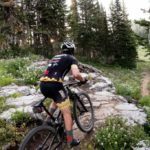 On Friday morning race director, Warren Gerow, gave Scott and me a riding tour of some of the course, which was very helpful because it covered some of the more technical single track and sketchy “rake and ride” sections. Race start was pretty typical sprint for the trail, with the usual silly risk taking for very little gain. Not wanting an early crash or quick burn out, I was content to settle in behind the large front pack. About 15 minutes in, Greg Golet came cruising by and I got on his wheel. I managed to stay on his wheel for about 15 minutes while he passed several riders. Just after we passed Scott, Greg kicked the pace up, I fell off and Scott passed me back. For the next couple of hours I plugged away, my technical riding getting more comfortable and pushing a big gear on every road climb. I finally caught Scott on the Esker trail but he was having none of that and gunned it dropping all but a few of a train on riders I’d brought up. Barely hanging on through the poplar stream trail, I knew I needed to drop him (and have any chance of catching Greg) on the road and/or Crommets trail after aid 4. I was never sure I had dropped him because I was passing many of the 50k racers and it was hard to see who was behind. Seven minutes later, NUE Marathon Series defending champion, Scott Burrill, Bikeman.com, finished third in 5:44:25. 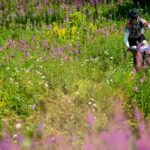 “This was my fifth or sixth time riding the Carrabassett Backcountry Challenge and by far the best. The race organizers really nailed it this year and we were graced with perfect racing weather and trail conditions! Coming into the race after two weeks of nursing a summer cold, my strategy was to go in slow and steady and to keep an eye on Jeff Clayton. The first 20 miles or so went well. I got ahead of Jeff after the first gnarly downhill from West Mountain. I knew, though, that he’s a steam roller and gets faster as the race goes along. 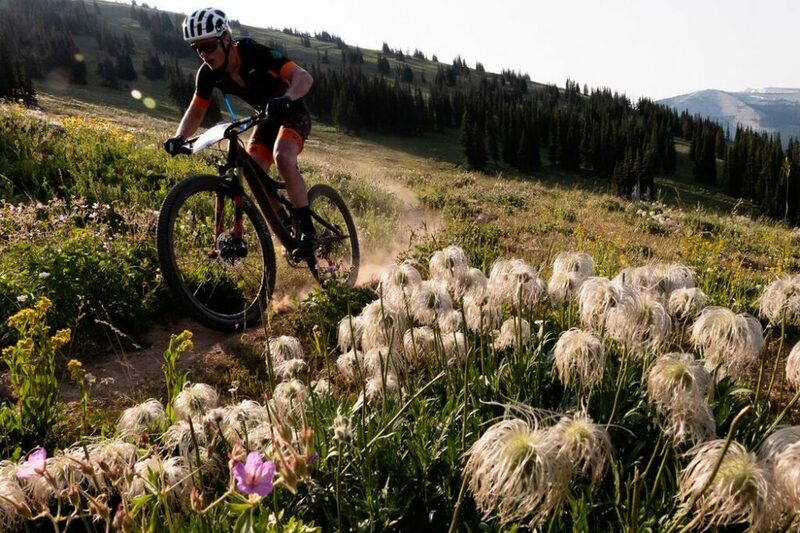 WHATS NEXT: NUE Epic Series heads to Bend, Oregon on July 21 for the High Cascades 100, a race around the volcano of Mount Bachelor. 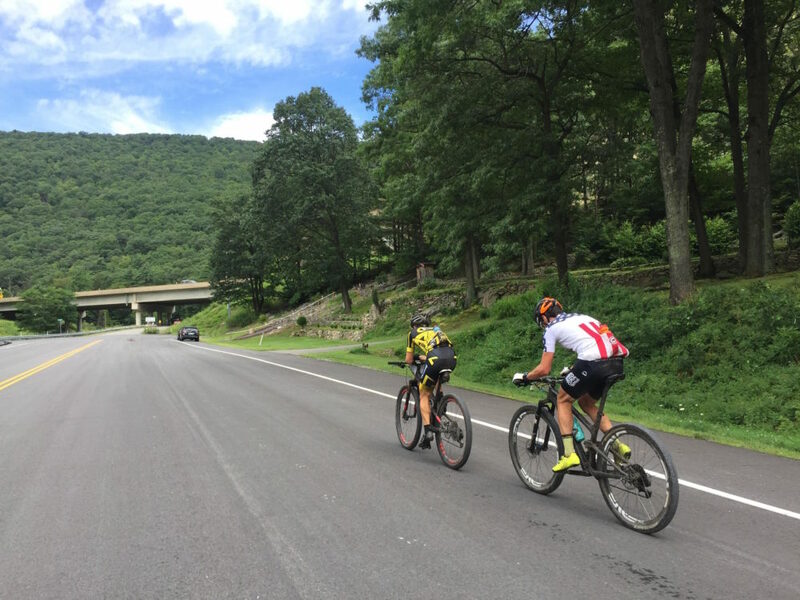 One week later, NUE Marathon and Epic Series racers will head for the challenging hills and rocks of State College, PA for the Wilderness 101. 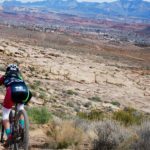 Saturday’s True Grit Epic saw it’s biggest-ever field with over 600 racers taking on the treacherous, rock-strewn course tucked in the south west corner of Utah. The record-setting participants were rewarded with some of the best race conditions possible with calm winds, temperatures in the low 60s and overcast skies keeping the sun at bay. All this allowed racers to post some of the fastest times around the notoriously techy True Grit course. 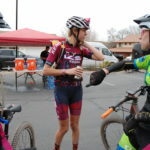 The NUE opener experienced a youth infusion with riders like Gwendalyn Gibson (Norco) and Hannah Finchamp (Clif Bar) who just recently left the junior ranks. 50 miles was not too much for these youngsters though as the powered away from the outset battling each other most of the day. Gibson took the win with Finchamp just minutes back. It wasn’t all about the kids though as Jenni Smith (Kenda/Cannondale) who just turned 45 rallied all day and finished just behind in 3rd. Nicole Tittensor (Scott) and Liza Hartlaub (GU Energy Labs) finished off the podium in 4th and 5th. The men’s marathon was a showdown between Justin Lindine (Apex) and another youngster testing out the long distance scene, Zach Calton (Spry/ LPB Sotheby’s). The two rode wheel-to-wheel through the most technical first half of the race before Lindine opened a gap and took the win after just missing it last year in a sprint finish. Former winner Alex Grant (Maybird/Cannondale) took third followed by Nic Beechan (Trek) and Clayton Otto (Giant). 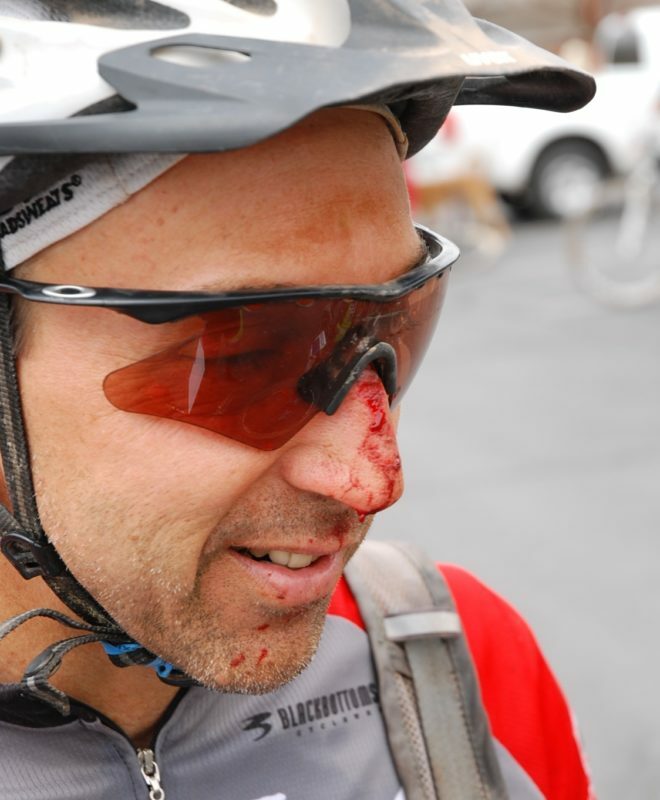 Dave Harris won the 50+ marathon event but had to leave part of his face on the course to do so proving that even living in St. George and riding these trails everyday doesn’t give you a free pass on the True Grit course. Lideen was challenged throughout the opening lap and a half by Pete Karinen (Broken Spoke Racing) before a flat, on the second pass through Zen trail, sent him back in the pack and Brazilian Stefano Barberi (Team Barberi) took up the chase. He couldn’t catch Lideen as he finally finished second followed by David Krimstock (Pearl Izumi/Pivot). Pete Karinen rallied after his flat to finish fourth with Coulton Hartrich in fifth. 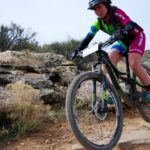 Larissa Connors smashed the True Grit course winning by 30 minutes over Sparky Sears (First Hand MTB) and Carla Williams (Joe’s Bike Shop). Connors was so fast she would have placed just off the podium in the open men’s category in 7th. Chase Hansen (CZ Racing) finished 4th followed by Lauren Cantwell. 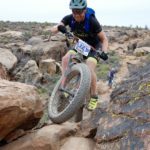 By far the most exciting part of the 2018 True Grit Epic despite the great weather, amazing views, brutally fun course, and fantastic volunteers and staff was the number of young racers on hand. 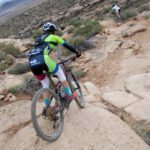 The number of participants under the age of 21 was truly impressive and a testament to the success of the NICA high school racing league in the southwest. Dozens and dozens of kids strapped on their helmets and conquered one of the toughest endurance events in the country with many even contending for race wins. It was an exciting development I hope we continue to see for years to come. In 1809, 81 year old General John Stark, a Revolutionary War Soldier from New Hampshire, declined an invitation to a Battle of Bennington reunion because he was ill. Since he could not make the event, he sent a letter with the quote “Live free or die: Death is not the worst of evils.” that was to be read for the toast. New Hampshire later used part of this toast for their State motto: Live Free or Die. The Hampshire 100, now the NUE Crotched Mountain 100, lives on with the same ideals and the same rugged, rocky course racers have come to expect from the Granite State. Following last year’s retirement of beloved NUE Hampshire 100 founder and race director Randy Whitney, who led the race successfully for a full decade, this year’s race was renamed “Crotched Mountain 100” and moved from Greenfield Park to its new location at Crotched Mountain Resort, formerly an aid station along the same race course. Under the leadership of new race director, Andy Gendron, this year’s race maintained the same course and divisions but moved from Sunday to Saturday offering free camping at the resort, outdoor showers, BBQ, games, plus two great brews from Baxter Brewing including Stowaway IPA, a new Imperial Hefeweizen, and live music on both Friday and Saturday. A nonstop soaking rain greeted riders all day on Friday with much conversation centered on what the nearly 2.5 inches of rain in a single day would mean to course conditions. Williams makes it five in a row this season! 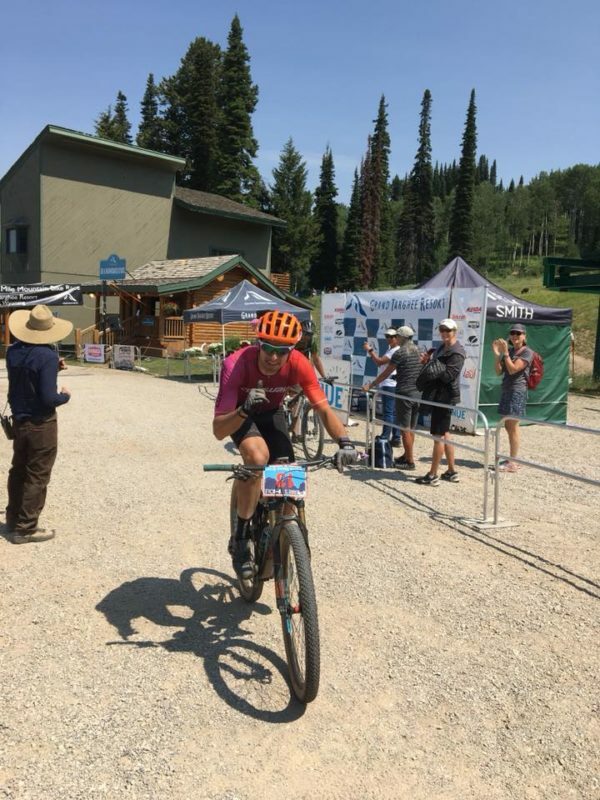 Defending NUE Epic Series Champion, Carla Williams, Joe’s Bike Shop Racing, was the first and only women’s finisher of the 100 mile race at 10:53:03. 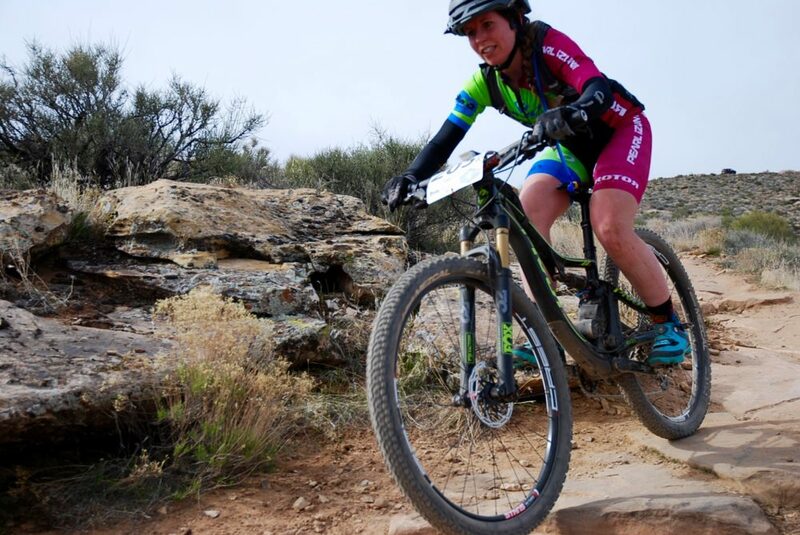 Following impressive wins at the Cohutta, Mohican, High Cascades and Wilderness 101, Williams has a commanding lead in the Open Women’s division with five straight wins in the NUE Epic Race Series! “I think CM100 is one of the toughest NUE races out there, especially if it rains the night before. It down poured all day on the Friday before the race, and the trails were pretty muddy and slippery. The course is really fun, lots of technical singletrack riding, lots of punchy climbs, and there is never seems to be a time to recover on the course. I was feeling great for the first two laps, staying upright on all the slippery rocks and roots, and really happy with how I was riding the singletrack sections. 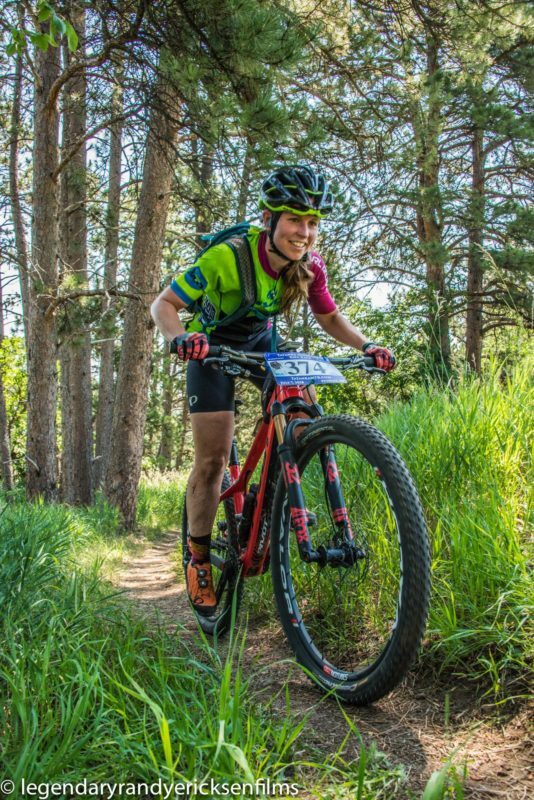 Last year’s race winner and four-time Hampshire 100 MTB finisher, Anne Pike, Team DNA-Movement p/b Penetron, set out on foot this year winning the 100k Mile Run that was held alongside the MTB races. Pike finished the 100k course on foot in 13:20:00. Earlier this season, Pike achieved an impressive eighth place finish at the Mohican MTB100 followed by an even more impressive third place podium finish at the 28th Annual Mohican Trail Run 100 mile race, fifth oldest ultra-run in the USA, home of the first ever USATF National Championship for the one hundred mile distance in 2005. 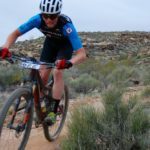 “For the last three years, I have been focusing on endurance mountain biking and raced predominantly in the NUE 100 mile series (finishing third in the series in 2014 and 2016) but I also maintained a fair amount of trail running throughout this time. 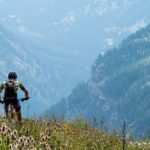 I had thought that for 2017, I would stick with endurance mountain biking as my focus although was keen to do one or two trail races, a couple in our area early in the year really appealed to me. With that in mind (along with recently adopting our Border Collie who, of course, became my running buddy) I found myself running more through the winter and early spring. So I raced the 50k in March and won then decided to go for a big jump up and do a 100k race in May which went really well, fourth place in a really competitive field. The plan was to do that and then pretty much shut my running down for the mountain bike season but I was having fun and some good success running and riding so why not combine both and see what might happen? So, knowing that the Mohican 100 mountain bike race is held two weeks before the Mohican 100 mile run I decided, why not go for it and really put myself to the test? 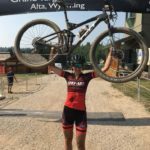 The mountain bike race was not the best for me this year but I didn’t really expect it to be anything special, I had been focusing more on running mileage after all. The run, two weeks later, was a huge undertaking for me especially considering the 100k in May was the furthest I had ever run and, prior to that, the furthest was 35 miles. Normally, people focus on a 100 miler months out to really prepare; well, I kind of did it on a whim! It wasn’t pretty but I survived and finished third. 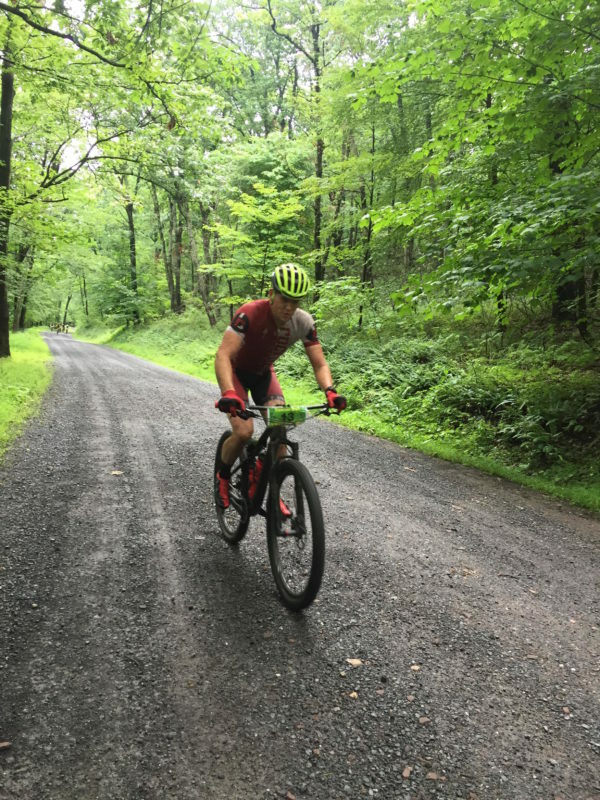 Again, after that race, I hadn’t any other trail races planned, wanted to see how I recovered, and also, so I could race Crotched Mountain and Shenandoah 100 MTB. Another last minute decision in the week of the race, I decided that I was feeling more excited about the thought of running the New Hampshire trails rather than riding and, since this would be my fifth year of racing there, why not switch it up?! So I did and raced the 100k trail race instead of the 100mile MTB, and won! Next up, I have Shenandoah on the schedule and a trail race in October. 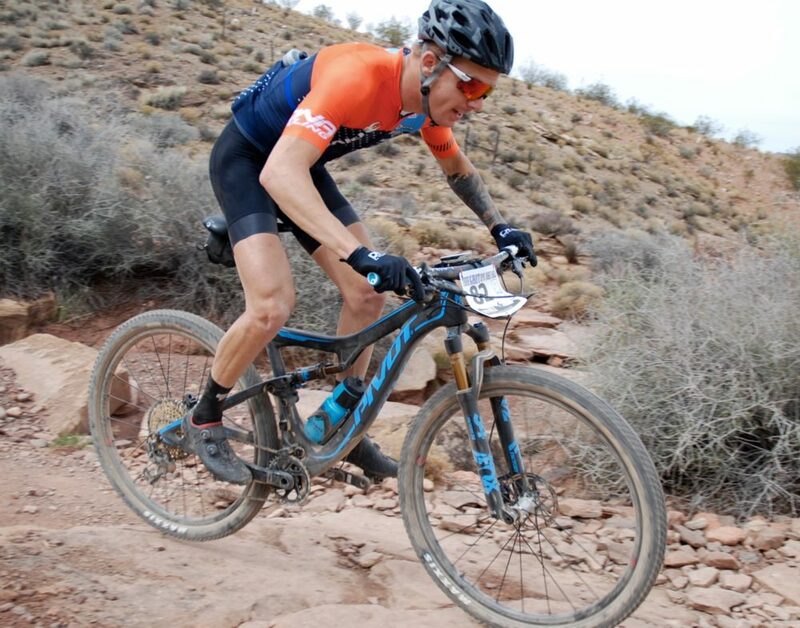 With just four races remaining in the NUE “best four of fourteen” Epic Race Series, Defending Champion, Carla Williams, Joe’s Bike Shop Racing, appears to be invincible! Johnson earns his fourth win, leads NUE Race Series! 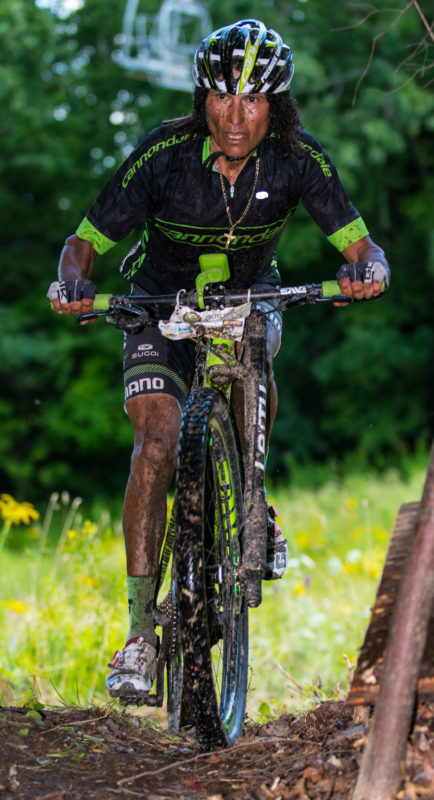 In a mirror of 2016, Defending NUE Epic Series Champion, Dylan “The Kid” Johnson, Cameron MTB, earned a narrow win in New Hampshire to finish 8:12:10 but, in doing so, now leads the NUE Race Series with a perfect score of four wins. Johnson, now 22 years old, has completed seven NUE races this season, so far, earning wins at Cohutta, Lumberjack, Tatanka, and Crotched Mountain in addition to second place finishes at True Grit, Mohican, and Pierre’s Hole. 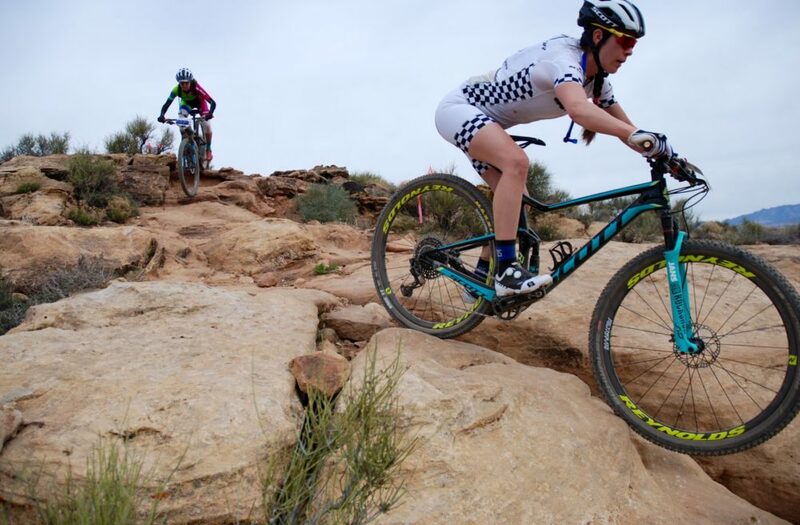 Twenty-three seconds behind the Defending NUE Champion, Hall of Fame Mountain Biker and Two-Time US Olympian, Tinker Juarez, Cannondale Factory Team, took second at 8:12:33 following a hard fought battle that saw a lead pack that stayed together for most of the race. Juarez placed third at last year’s Hampshire 100. 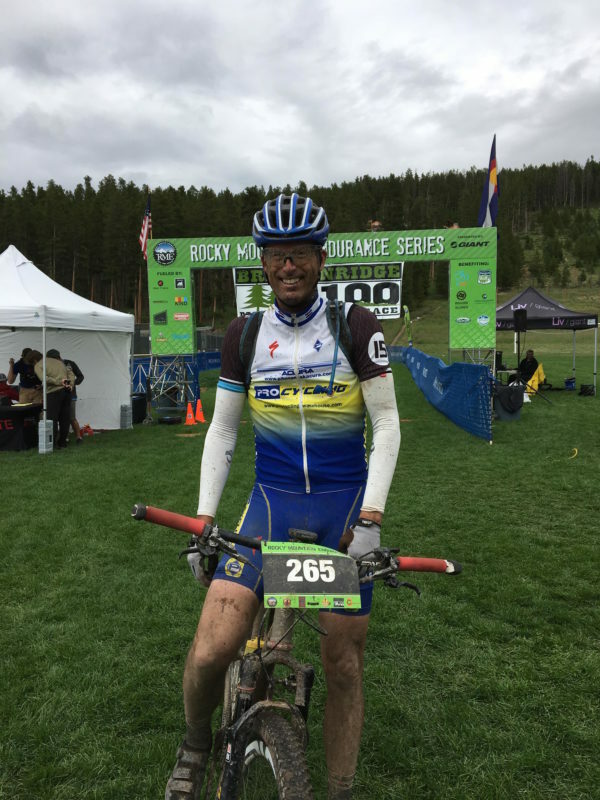 Now at age 56, Juarez continues to display amazing strength and stamina as an ultra-racer, often competing with racers young enough to be his grandkids. His passion for the sport he started in as a kid in the world of BMX has been an inspiration to NUE Racers and his many fans worldwide. 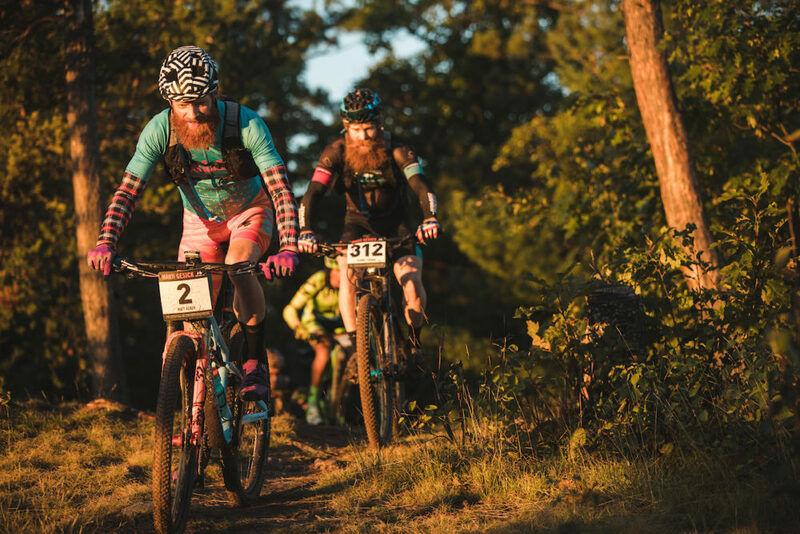 “Team Cameron Mountain Bike Racing had three of its six team members participate in the Open Men 100 mile race. I led out the first prologue lap up the mountain with Dylan Johnson closely behind. 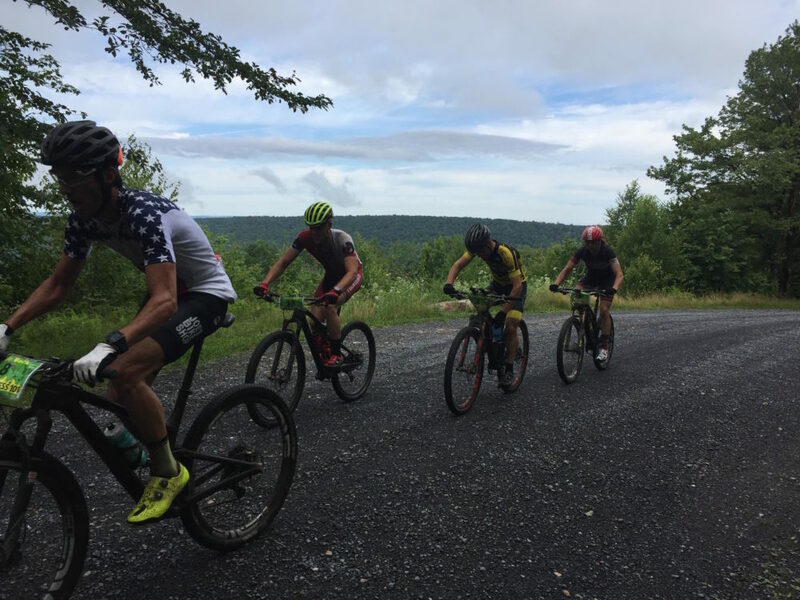 After about forty minutes of racing, the field was split into a lead group of Dylan Johnson, Ian Spivack, Brian Schworm, Tinker Juarez, Matthew Kesecker (Pivot racer from Canada), and Gordon Wadsworth. Around mile 15, right before the muddy technical single track, a group of the 100k leaders joined our group. I could not keep up with the lead group through the first lap of the muddy and slick, so I settled back into my own pace. At about this time, I noticed that my left foot cleat was coming lose, so I was careful throughout the rest of the lap so I would not break the cleat off. I got to the end of the 1st lap and swapped out my left shoe and refilled. At this time, my team mate- Matt Merkel caught up and we rode the rest of the second lap together. At the start of the third lap, Matt was fading a bit so I kept going at a steady pace. About half way through the third lap, my right cleat came loose and I could not unclip easily, so I decided to take it easy throughout the rest of the lap. I got my shoe changed at the final aid stations and, while waiting, Matt caught back up to me. We then rode together to the finish line by keeping a steady pace. Mathew Merkel, Cameron MTB, finished 9:24:57 in fourth place. With this finish, Merkel is now fifth overall in the NUE Men’s Open point race. 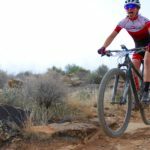 “Coming off a good race at Pierre’s Hole 100, I was pumped for an NUE race here in New England, but knew I needed to ride smart. Rain the night before made for wet and slippery conditions creating slick roots and large mud holes. My plan was to go out at a comfortable pace dropping back from the leaders early on. I was able to catch my teammate, Ian Spivack, on the single track where he was having shoe issues. We were in fifth and sixth at the end of our first lap and decided to work together going into lap two allowing us to keep a steady pace. Ian was climbing strong so I dropped back at the beginning of our third and final lap, but ended up bridging the gap rolling into the last aid station. 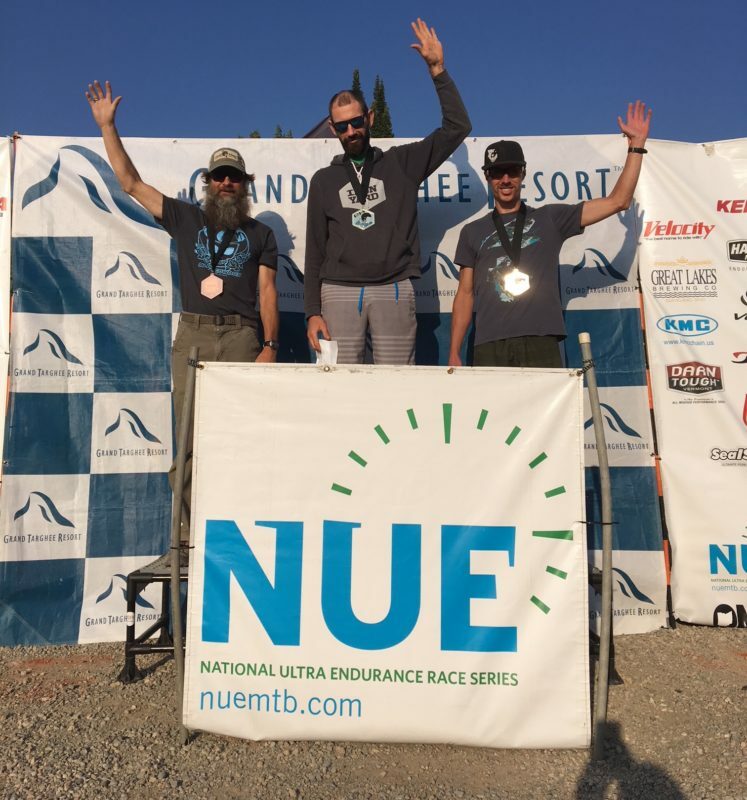 With just four races remaining in the NUE Epic Race Series, Defending Champion, Dylan Johnson leads with four wins with Brian Schworm in second and former NUE Champion, Christian Tanguy holding second in the point race. 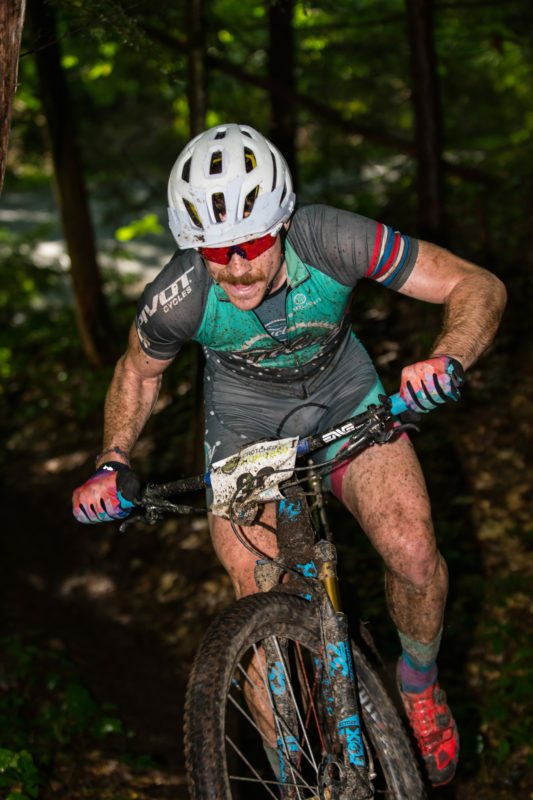 NUE Epic Series Defending Champion, Gordon Wadsworth, Blue Ridge Cyclery/Pivot, earned his third straight win in New Hampshire, to finish 8:17:48, crushing his nearest SS competitor by more than an hour and a half, good enough to place third overall! This is the second NUE Epic Series SS win for the defending champion who also scored a win at the Wilderness 101. “I had a super race; decided to come and do the CM100 last minute and was glad I did! Lots of rain put a damper on the camping but the pre-race atmosphere was still great. The new venue was super and the new start/finish for the course was welcome as it changed the rhythm of the race nicely. I had a great start and was pushing the pedals on the Pivot Cycles LES smooth as could be. When we launched into the single rack, we were greeted with the expected muck and east coast snot that rain can bring. New Hampshire trail is quintessentially East Coast with its rocks, roots and tight twisting singletrack. Everything was slick! I was sitting really comfortably in the top five or so as I usually do when we were nearing the final stretches of singletrack in the first half of the course. We had all been cautious because all of the roots and bridges were extremely dangerous. Sure enough, on one of the last bridge crossings I slid out like Michelle Kwan rolling a triple sow-cow. I sat up on the side of the bridge and took stock. Immediately I knew I had broken and dislocated my pinky finger on my right hand. Perhaps my only muncher when it comes to racing hundred mile events is “don’t stop, and don’t lose the wheel.” So I gave one good tug on my right pinky to reset the break, daintily walked across the rest of the bridge, and hopped back on to Chase the front pack. We had, by then, joined the one hundred K leaders, three of them; So I knew that that would be affecting our hundred mile race more than a little bit. My biggest concern, at this point, was completing the event. I’ve committed pretty late to the NUE this season so I need finishes and wins whenever possible. I knew that I wouldn’t be able to handle the bike as good as I normally do, but I expected I could be at least proficient and I raced past pretty quietly the rest of the day. As the one hundred mile participants dropped off and dwindled and the 100k finishers completed their journey, it was down to just me, Dylan Johnson, and Tinker Juarez. We pitted briefly at the end of lap two, and immediately the duo dropped me heading up the ski climb. I tried to hang tight to their wheels but my broken finger was really killing and preventing me from climbing out of the saddle as well as I normally can. The two slight figures got even slighter and soon I was solo. I spent the rest of my lap suffering solo. I was thinking I might see my Canadian Pivot OTE teammate, Matheu, come up behind me but, nevertheless, stayed alone. Peter Bradshaw, Mad Alchemy|Zancon, was second at 9:57:22. Joseph Stroz, Stroz Physical Therapy, was third at 10:25:49. 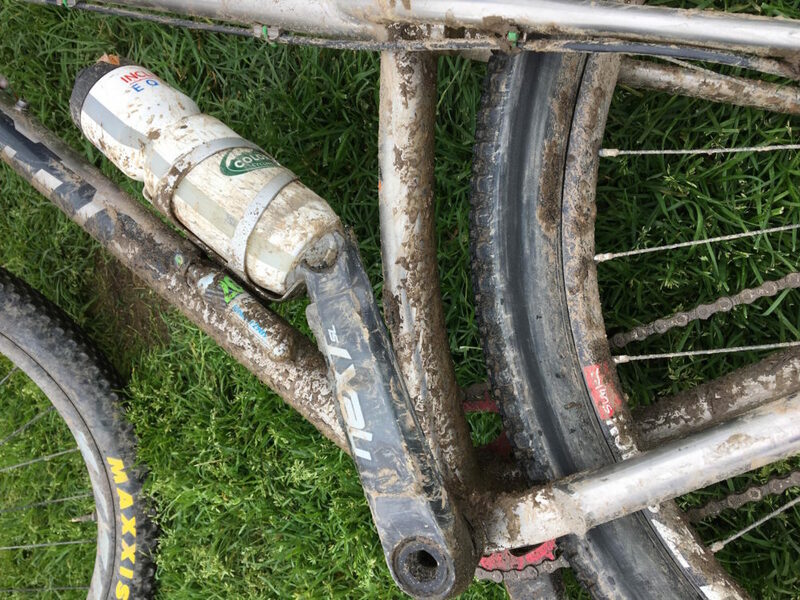 “I rode a 32:19 gearing for my ss this year, a bit taller than last year. I was hoping for a drier course with this gear and took a chance before leaving for NH Thursday from PA. After the hours after hours of rain Friday evening I knew that I was in for a long day. My gearing for this race was a bit tall for the conditions and with a calf injury from earlier in the week; I had to pace myself carefully from the start. I pulled off from the front group after the second climb from the start. Peter (2nd SS) continued on to challenge Gordan Wadsworth and top open fellows in the front group. I figured Peter would burn out his legs during the first lap trying to keep up with their pace so I decided to pull back and pace myself with Carla Williams, always a sure strong finisher. I stayed with her for the first two laps hoping to catch up with Peter, but I was never able to catch up with his pace. At the end of the second lap, I passed Carla going into the self-support aid station and from there I was on my own. 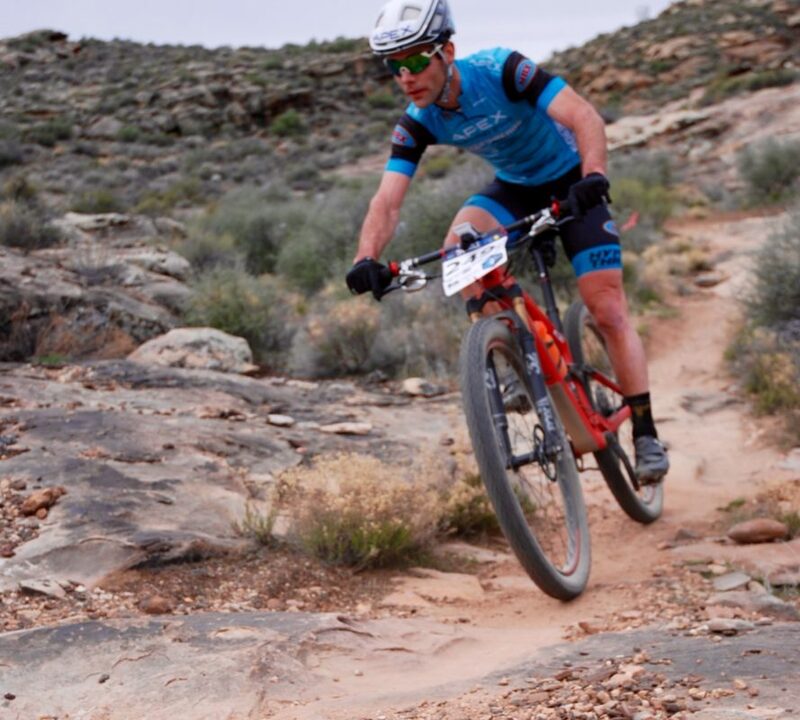 With just four races remaining in the NUE Epic SS Series, defending NUE Marathon SS Champion, James Litzinger, is now leading the NUE Epic Series with 13 points. Matt Crawford is holding second with 17 points, and Peyton Randolph has 25 points and Joseph Stroz in fourth with 35 points. Three wild cards threaten to shake up the standings with Defending Champion, Gordon Wadsworth, John Haddock, and Ben Shaklee each with two wins this season. With a comfortable lead, 2015 Hampshire 100 Masters winner, 54 year old, Terry Blanchet, Nav-North American, took the top spot once again in the Masters to finish 10:04:00. 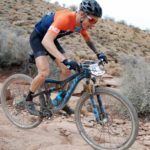 Blanchet placed fifth at last year’s race that was won by the Jeff Clayton, Georgia Neurosurgical Institute, who would go on to secure his first NUE Epic Masters Series title. With this win, Blanchet completes his fourth NUE race that includes seventh place finishes at both Mohican and Lumberjack plus a more recent third place finish at the Wilderness 101 moving him up to fourth place overall in the NUE Epic Masters series with 18 points. “Looking over the pre-registration list of eleven Masters my neighbor, David Boyce just 30 miles east over the MA border, was my most obvious concern, as last year on this same terrain, he beat me out by one position in the finale Hampshire100. Sure enough, early in the first lap, we went back and forth a few times though, after some side-by-side chitchat on the mid-lap Fletcher Farm climb, commiserating about one particularly grumpy runner refusing to cede the line on the preceding narrow section despite our three courteous requests, David decidedly took off over the top and disappeared through the next singletrack-heavy five miles. I eventually caught sight of him again on the road-heavy section of the first lap beyond the Oak Park Aid Station next to the old Hampshire100 venue at Mile 21, but as he was already moving at a good pace with a Bikeman racer from another field to share the work with, I didn’t burn any matches at that early point trying to bridge up and, as the road gave way back to trail on the descent beyond Muzzey Hill, he again disappeared into the woods. My next sighting of David wasn’t until this same stretch a whole lap later, with him just heading off from the Oak Park Aid Station as I was rolling in. This time on the road-heavy section to follow, as I was pulling towards him, he was sitting upright hands-off-bars stretching his back, and I passed by with little obvious response from him, only hearing of him again as I was climbing the ski slopes out onto the third lap while his name was being called over the PA during his descent at the close of his second lap. Of the pre-registered Masters, there were a handful about which I really had no prior experience and, sure enough, wouldn’t it turn out that the racer in the Mathieu Performance jersey with whom I’d gone back and forth with over the first lap was Eric Truchon, one of the other Masters racers. In fact, we’d swapped positions so many times that, once I’d noticed that we’d finally stopped seeing one another midway through the second lap, I’d lost track of who was in front. Having a suspicion that he might well indeed be another Masters competitor, it was with great relief upon my third-lap arrival at the Oak Park Aid Station to be greeted by a cheerful “Number 50, we’ve been waiting for you, you are the Masters leader!” Spirits buoyed and a couple Coke cups down the hatch, I was energized for one last trip across that road-heavy section, climbing up through the woods jeep trails to follow, and relishing the last roll down the ski hill singletrack to the finish. Seventeen minutes later, 50-year-old Eric Truchon, Club Mathieu Performance, took second at 10:21:15. Four minutes later, 56-year-old, David Boyce, State 9 Racing, claimed third at 10:25:07. Boyce placed fourth at last year’s Hampshire 100. “My race started out well keeping pace with the master’s group and then I settled into my own pace. I felt good and started to pull away from my group; but this was not the right thing to do because the damp trail took its toll early in the second lap. On one of the dirt roads about midway through the second lap, Terry Blanchet flew by me and pulled away. That was the last time I saw him. Towards the end of lap two, I was feeling pretty gassed, did not stay hydrated or fuel right, and did not want to go back out for lap three. As I came down to the pit area, my State 9 racing team was cheering me on and my wife gave me my bottles and asked if I was ok. I said I no, but I feel better now. On the third lap, I started up the ski slope. It was hot, humid, and the trail was like a sponge. When I got into the trees I got off, had some gel, drank a bottle, and started again. There was nobody; it was quiet, and I was feeling somewhat better. I got to the luau aid stop, ate some bananas, drank some coke, and continued on. I met up with Joe Stroz on his SS and we rode together in “survival mode”. 54 year old Alain Simard placed fourth in 11:17:52 gaining two points in the NUE Masters battle with 52 year old Alan Minor, Banks Bikes Falmouth, who placed sixth on the day. With just four races remaining in the NUE Epic Masters Series, the battle continues as Defending NUE Masters Champion, Jeff Clayton, with three wins and two second place finishes, sits second to Greg Golet, who has a perfect score with four points, potentially setting up a rematch of the 2016 showdown at the final Championship race that was won by Clayton. The battle for third continues with Russell Spaulding at 16 points, Terry Blanchet at 18 points, Alan Minor at 21 points, and Alain Simard at 25 points. Toops wins! Leads NUE Marathon Race Series! OMBC Ohio Race Series Defending Champion and NUE Marathon Race Series points’ leader, Jen Toops, Paradise Garage Racing, demonstrated her strength with a convincing win in 7:04:34. 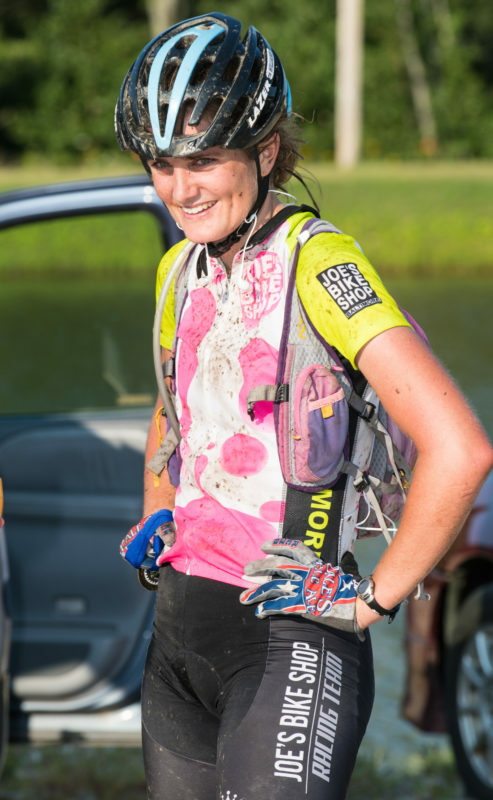 In a bid for the NUE 100k title, Toops has a near perfect score of 5, leading the NUE Marathon Women’s Race Series with wins at Big Frog 65 and Tatanka 100 along with her second place finish at the Mohican 100k in one of the largest women’s fields this season. “My husband and I loaded up the transit and headed off to NH to ride some new terrain. I wasn’t sure how the race would go after going over the bars last week. My lock out lever punctured my thigh all the way to the muscle earning myself a few stitches. It rained the whole twelve hour drive, while we set up camp, and while we went to bed. I woke up to a foggy morning which gave way to a beautiful sunny day! A quick racers meeting at 6:30 and we were off racing. The race started out fast and I settled into my own pace making sure I was out front going into singletrack first for the ladies. I knew it was going to be a long day due to course conditions. This was my first time riding in the New England area. The singletrack was challenging: tight, twisty and rocky with lots of wet slippery roots and very little areas for recovery. 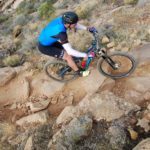 I was glad I brought my Pivot Mach 4 instead of the hardtail! I saw another 100k female at aid 2 as I was leaving, so I picked up the pace and really pushed it on the road. I finished the first lap, switched my pack out, and started the second lap. The soft wet grassy climb out of the ski resort was brutal. Really, all the climbing on lap two was rough. It seemed like it was getting slicker as I wrecked on a downhill and again on a long bridge. Luckily, I wrecked on the side opposite of my stitches and chatted with my new friend Tom for a while which made the miles go down a little quicker. Forty one minutes later, Donna Winters, Cycle Solutions Canada, took second at 7:45:40 for her best NUE Race finish of the season! With this finish, Winters moves up to second place in the NUE Women’s Marathon Series with 29 points in a lowest points wins series. She was 13th at True Grit, fourth at the Big Frog 65, and tenth at Mohican 100k. 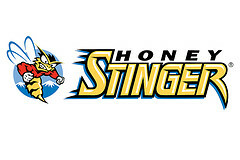 Sarah Brown, Honey Stinger, earned her best NUE finish this season at third in 9:11:19. Brown has improved her standing at each race significantly all season. 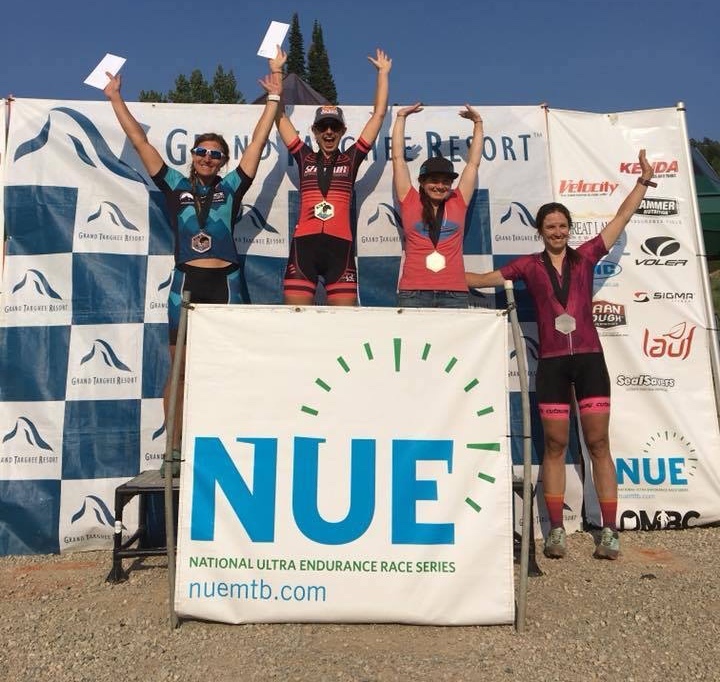 With this podium finish, Brown moves up into third overall in the NUE Marathon Women’s Series standings. 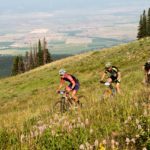 “What a challenging year at the Crotched Mountain 100! I trained longer and harder this year than any other. I have been setting some good PRs at races, and was hoping to get a really good PR at Crotched Mountain. Well, course conditions didn’t allow for that, but I was very happy to get through! I slipped and slid around on the wet trails, got lost and did some extra miles, but I just hung in there, knowing how rewarding finishing would be. Lightning Strikes Twice! Scott makes it two in a row! NUE Carrabassett 100k race winner, Andy Scott, Riverside Racing, earned his second straight NUE Marathon Race Series win taking the NUE Crotched 100k win in 5:19:35! With just three races remaining, will Scott take the national series title? Just over two minutes later, Derek Treadwell, Dr. Naylor Treadwell Training/Kona, finished second in 5:21:58. At age 42, Treadwell is a top series contender this season including his fourth place finish at the Big Frog65 in Tennessee in March. Three minutes later, NUE Marathon Men’s Open Series leader, John Petrylak, Scott Pro Mtb Team, took third at 5:24:36. 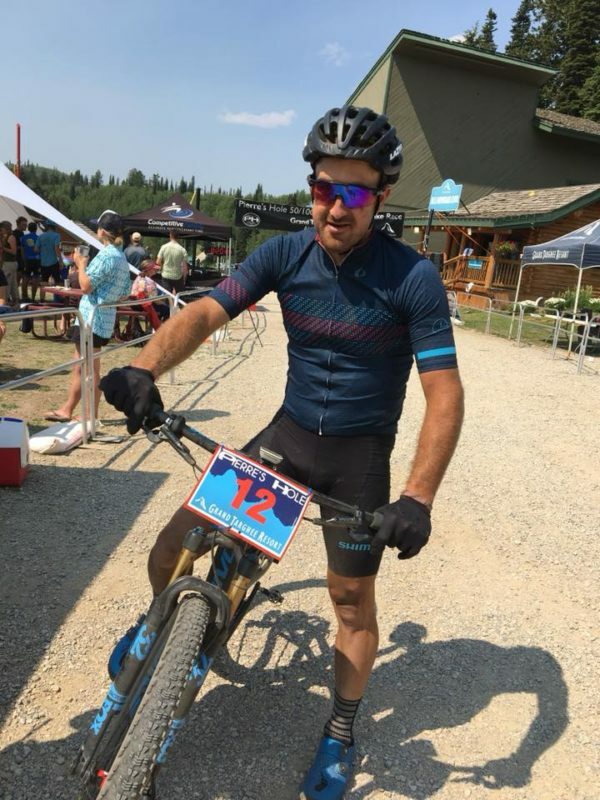 Petrylak leads the NUE Series with 13 points including a second place finish at Carrabassett, third place finish at BigFrog 65 and a fifth place finish at Mohican 100k. The Crotched Mountain 100K race course was getting a significant watering the day and night before the race; I was mentally preparing myself for what was sure to be a wet and muddy adventure in the morning. Since the race changed venues (formally the NH100), I was curious how the new start/finish area would be. As soon as I walked in to sign up, I was immediately at ease; the new promoters did a great job with all things race related! Thanks for carrying on the tradition of this great race. We had a 6:48am start time (three minutes) behind the 100 milers. After my usual warm up routine and the brief riders meeting, I lined up and found some familiar New England faces and a local Virginia face nervously waiting for the start of the race. We all lined up and, after a few seconds went by, we were off! Locals Andy Scott, Derick Treadwell, Dylan McNicholas and myself were all hammering up the 1.5 mile start climb. At the top of the climb, we started catching 100mile riders right away. After the first couple of miles, the 100K group was down to four or five riders; we stayed together and began catching the chase groups of the 100 mile race. Once we hit the double and single track, I was pleasantly surprised to find that the course handled the rain very well! We definitely had water and mud but nothing like I thought it would be. The start was seriously fast, even for a 100K race; at around 8.5 miles we caught the lead group of the 100 mile race. The race leaders were Dylan, Tinker, Wadsworth, Brian, Mathieu, and the lead 100k group. This was an awesome group to ride with! I started having some stomach distress about two hours into the first lap; I tried drinking and that made it worse, so then I tried eating and that made it really bad. So I decided to let the food in my stomach digest. I would resume my fueling shortly but that never happened so I started to dig myself into a bit of calorie deficit. I was able to respond to constant pace upticks on the short steep climbs but the constant efforts began to take a toll on me. As we came through the start/finish area and started lap two, I grabbed another bottle and started off hoping for the best. The lead 100k and 100mile group continued on through lap 2; we lost a few guys but mostly everyone was still riding strong through mile 35. As we came up to the first aid station on the second lap, I had to stop and get some Coke to try and get some calories in my stomach. It helped! Why does Coke fix you when you’re broken? I motored on and started to see the lead group WAY up on the long straight road sections. I ratcheted up the pace in the single track and tried to minimize the damage on the fire roads. At around mile 52, I was two minutes behind the leaders but never could close the gap. The course finishes with a 2.5 mile climb back up to the ski resort and I was not in a good place to get back the time I had lost. I struggled a lot but it paid off and I managed to secure my 4th podium of the season by finishing 3rd. 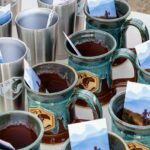 The Crotched Mountain 100K was organized, well-marked and So much fun! The course has a perfect mix of classic New England single track, double track and just enough gravel roads. Thanks to Andy and Crotched Mountain for hosting an instant classic event! Eleven minutes later, teammates, Andy Gould and Aaron Miller, State 9 Racing, took fourth and fifth respectively at 5:35:55 and 5:48:35. With just three races remaining in the NUE Marathon Men’s Open Series, John Petrylak leads with 24 points and Anthony Toops with 101 points is in second as the first two racers completing the four race minimum. Contenders include OMBC Ohio Series Champion, Drew Purcell, and Greg Kuhn, each with three finishes so far. Wild Cards include race winner Andy Scott with two wins, and Andrew Dillman with his second place finish at Big Frog 65 and a big win at Mohican. Dan Giroux, The BSWC, won the SS division in 6:13:37. “Having raced the New Hampshire 100 as a 100 miler in the past, it was easy for me to convince myself that with the new venue with the shorter 100k distance was a way better idea. That being said, the thoughts of more fun and less pain had me pretty stoked for Saturdays race. Then the rain came and with it, the realization that the course was gonna be a slop fest to start the day. Luckily, the rain let up and, although there was some mud out there, overall the course was in great shape. Thirty one minutes later, Dominique Avoine, Mathieu Performance, secured second in 6:44:50 riding a 22Tx17 on his Exprezo T29 custom built. “The personal feelings of this race day were not that well. Those days exist and I had a too-short pre-race morning preparation. I went to the starting line without my usual stuff: Bike (SingleSpeed instead of a full suspension and full gearbox bike! ), electrolyte (forgot them in the van!) and glasses (wrong pair!). Anyway, I followed the racers to set the pace. At the quarter of the distance, I started having leg cramps, slowed down, and stopped at the aid station to make a refuel of electrolyte. It was too late, sadly. I managed it and finally found my legs after 70 km finishing strong after having a throttle pace race. This was my second SS race for an endurance distance and I felt okay with second place. I plan to go to Gaspesia100 for the 100 mile race on September 3rd. With just three races remaining in the NUE Marathon SS Series, no racers have completed the four race minimum. However Eli Orth leads with 12 points and Tim Winters has 22 points each completing three races. Wild Cards include Shannon Boffeli with a win at True Grit plus a third place finish at Pierre’s Hole. With a fourth place at True Grit and second at Mohican, Scott Williams could make a late season run for the title as well. 57 year old Tyler Munroe, Riverside Racing, was the winner at 6:14:46. “The race was a mass start as usual, so you never really know who is in front of you or how many. The sorting loop was just that as there was a bit of climbing in it and the Elites were ramping up. I tried to stay in contact with the top 15 as I did not know who my competition was and thought it best to stay as far forward as I could. After the sorting circuit, I settled into a pace that was just above what I knew I could handle for the whole distance and passed a handful of riders, a few of which were in my class. I settled in to the HR and power I wanted to be at and just kept focused, making sure I made no mistakes. I had a plan to go hard where it was hard and go easy on the road sections to recover while still carrying speed; this plan worked well all day and I had energy at the end. As for food, I planned to not stop at all as I had a Camel Back and a 20 oz bottle all with 60/40 Gatorade water mix. For food, I can do this distance on Gu alone and that is what I did, eight to be exact. I did have to stop with about ten miles to go for water and Coke. Just two minutes later, team mate 51 year old Paul Richard, Riverside Racing, took second at 6:16:08. Six minutes later, 50 year old Scott Burrill, Bikeman.com, was third at 6:22:35. “Crotched Hundred was my fourth NUE of the season and the second time I’ve run this race. Last year, it was wonderfully dry conditions and this year was the opposite. Friday night’s rain just drenched the woods. My primary strategy was conservative; I just wanted to finish the race with no technicals or crashes as this was my last chance to rank for the series. The course was super-snotty requiring great focus and caution on the technical single-track of which there is abundance on this race course. The first lap went very well with overcast conditions and good temperatures. The sun came out for the second lap and it was like someone turned the oven on; things got real warm and humid with nary a breeze. With just three races remaining in the NUE Marathon Masters Series, Scott Burrill leads the series with eight points. Defending NUE Marathon Masters Champion, Anthony Hergert, holds second with 23 points, and Nate Cross from Ohio, sits in third with 55 points following his seventh place finish at Crotched Mountain. David Harris remains a wild card with wins at both True Grit and Pierre’s Hole this season. Stay tuned here for the latest NUEz and information. Harvey wins with a sub six finish! Caedron Harvey, Fitzgerald’s Bicycles, was the first and only sub-six hour finish in the Women’s division at 5:57:59. Over the days leading up to the race, I had contemplated many forms of mild self-mutilation. I could convincingly twist my ankle in that pothole, come down with the flu the night before, or even poison myself with some substance that would wear off by 9am on Saturday morning; all very valid options. But alas, Saturday morning came, and I was healthy and fit. I guess I am racing. My mindset going into Pierre’s Hole was different than it had been for any of my prior races in my short career; I had finally come to accept that I can only ride as fast and as well as I can ride, and I need to be proud of whatever that means for me. That may sound obvious, but, as an extremely competitive individual with an unbelievable aversion to individual sports, it was a monumental recognition. That clarity of mind helped me approach Saturday’s race calmly, although the reality that 60+ miles and 7000+ feet of climbing was in my immediate future loomed large. 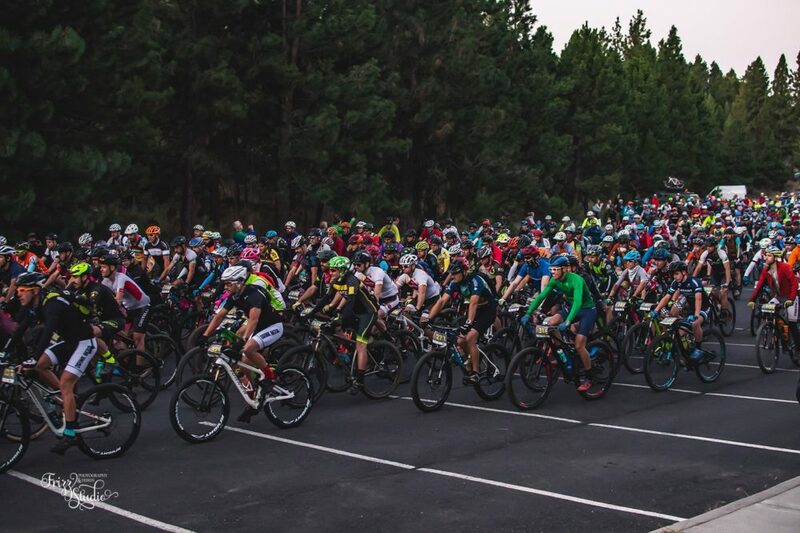 I had known that I’d face some stiff competition ahead of time, but, it wasn’t until I was standing on my bike at the start line that I realized just how much talent there really was. I enjoyed a brief moment of panic and heightened pulse, but I forced myself to remember my newly-developed mantra: ride your own best race. So, one deep breath and I was ready to roll. From the get-go, I was out to test myself. In the 90 seconds between recognizing the competition and the start, I had resolved to stick with the wheel of the reigning champ (Karen Jarchow) as well as I could. 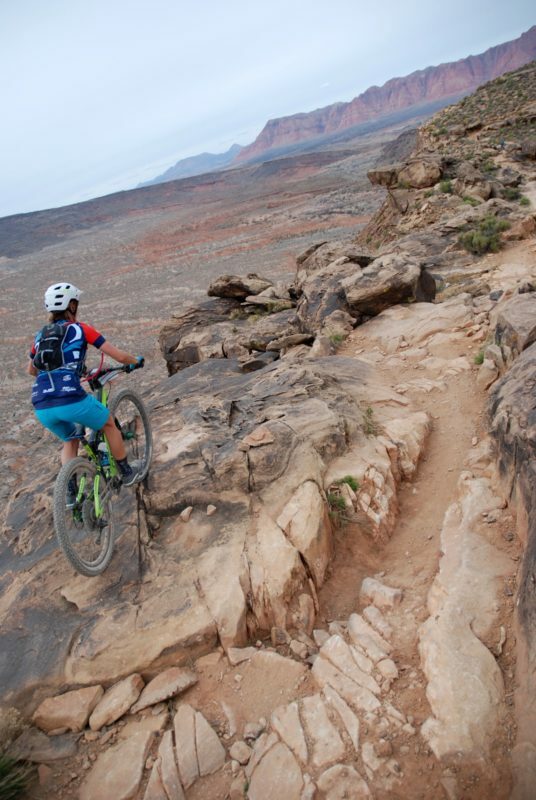 Within a few hundred yards, I noticed everyone around me dumping gears and spinning at a high cadence, and I was faced with a decision: I could pace myself to the experienced women around me, or I could ride the way that I know best and turn a harder gear. I went for it. I revised my objective, then, to be the first to the top of 38 Special, and try to gain some time on the descent. With that objective achieved, I enjoyed the long descent down 38 and Mill Creek, as I found greater comfort descending than climbing that day; my legs had felt pretty junky from the beginning, but I figured that the only way out of that pain was to push it. I was going to race regardless of my how my legs felt, so it wasn’t worth succumbing to my body’s whimpiness. Halfway through the first lap, however, I started to realize what I had done: I had sprinted out of the gates at a marathon, and placed the target on my own back. “Caedran, you are SUCH an idiot,” I thought to myself. I was convinced (for an entire lap and a half) that my competition was more disciplined than I was, and that they were conserving just enough to throw down the gauntlet on the second lap. With that thought on repeat, I rode to defend my position. I had no concept of the time gap, or how spread out the field was, so I just assumed that they would sneak up on me at some point. So, then, there’s that second lap. A real mental sucker-punch, not just because you’re setting out to what you just did again, but that there is more of it. So you ride through the start gate, end of lap 1, and your race is STILL not even halfway over. Hooray. I was feeling decent heading onto AJ’s trail, but was starting to worry a bit about my stamina. My legs were still giving me grief, but I wasn’t about to let them get the better of me. When I wanted to shift into an easier gear, I stood up instead. For the rest of the race, that was my tactic; since the first climb up Peaked, I had no idea how far ahead of Karen and Megan I was, but I wasn’t really interested in finding out. Heading up Peaked, I knew that something had to give. I had 30 miles left to ride, and I could not destroy myself on a long climb so far from the finish. Scoping the meadow below and seeing no one, I weighed the options, and decided that I could afford to conserve energy climbing Peaked, thinking that any time that I lost getting up there I could probably make up on the descent. Whether or not that’s true, it was definitely the right decision. Had I emptied myself on Peaked, I’m not sure that I would have been able to maintain a reasonable pace for the rest of the race. The second Rick’s Basin lap was tough; I knew my nutrition was waning, and was resolved not to lose my position in the final 45 minutes of the 6-hour race. I knew that, the harder I pushed, the less likely that was to happen. So, again, I pushed myself. I stood when I didn’t want to, and powered up the little punches that Rick’s throws at you. After finishing Northwoods, though, I started to feel a little weaker and a little less focused, so I managed to sneak some gummies in on the climb, while squeezing the rest in my grasp on the handlebar during the descents. With a few more calories in me, I just needed to be smart and safe for the remaining 20-or-so remaining minutes. I could almost start counting down the number of times I’d have to pedal uphill, which gave me so much joy and quite literally propelled me through Snowdrift and onto the home stretch. 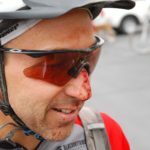 Before Pierre’s Hole, I had competed in the Pocatello Pedalfest in June, but crashed out and needed stitches in the eye – not super confidence inspiring. Later in June, I competed in and won our local Cache Creek Race, which is just 10.5 miles with 1,500 feet of climbing. Even for that race, I had thought hard about various minor injuries I could sustain the day before (or of…). Last year, I competed in Grand Junction and Pierre’s Hole, neither of which went particularly well. I finished third and fourth, respectively, but was so new to mountain biking that I didn’t really understand how to ride efficiently (or well), let alone race that way. 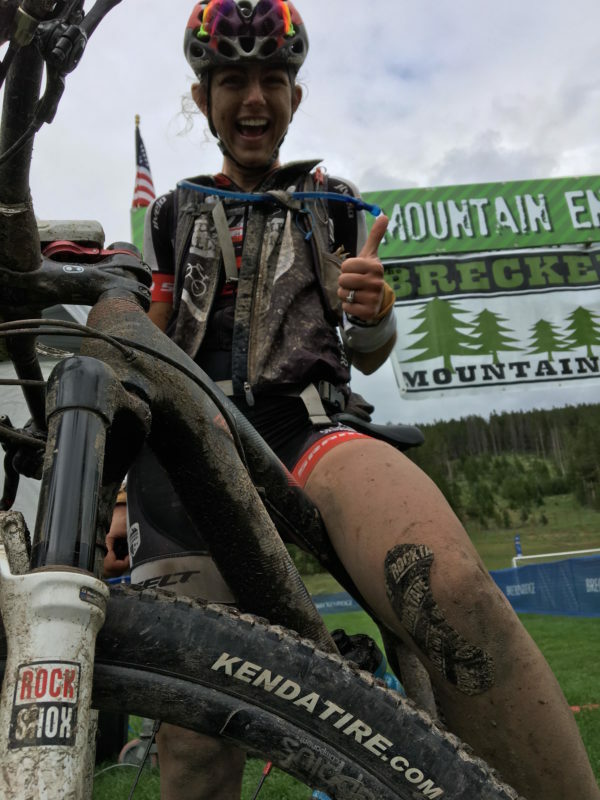 Ten minutes later, Meghan Sheridan, Bingham Cyclery Peak Fasteners, was second at 6:07:40. 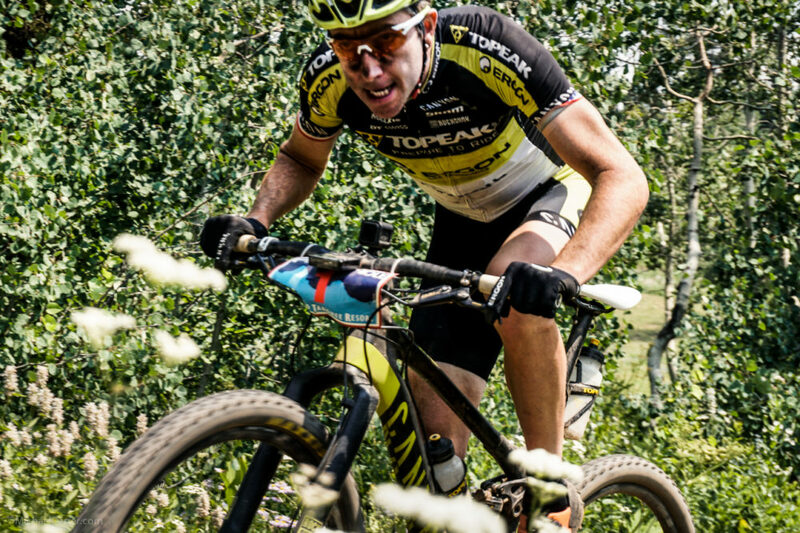 “This was my first time racing at Pierre’s Hole and I believe my first NUE race. I have done other long races in the past, including Leadville and the Point to Point in Park, City Utah multiple times as I live in Salt Lake City, Utah. I mostly only race locally and places within a short drive. Only twenty women lined up to race and I wasn’t even sure who my competition was. I was feeling good on the first climb and didn’t want to blow up as I passed Karen Jarchow (defending NUE Race Series champ) near the top. I then started to close the gap on who I thought was the only woman left out front (Caedran Harvey). I followed her close to 38 Special, where her skills surpassed mine and she gained some time on the downhill. I never saw her again. I just stayed steady and tried not to let any men pass me on the downhills for the rest of the first lap – which I succeeded at. 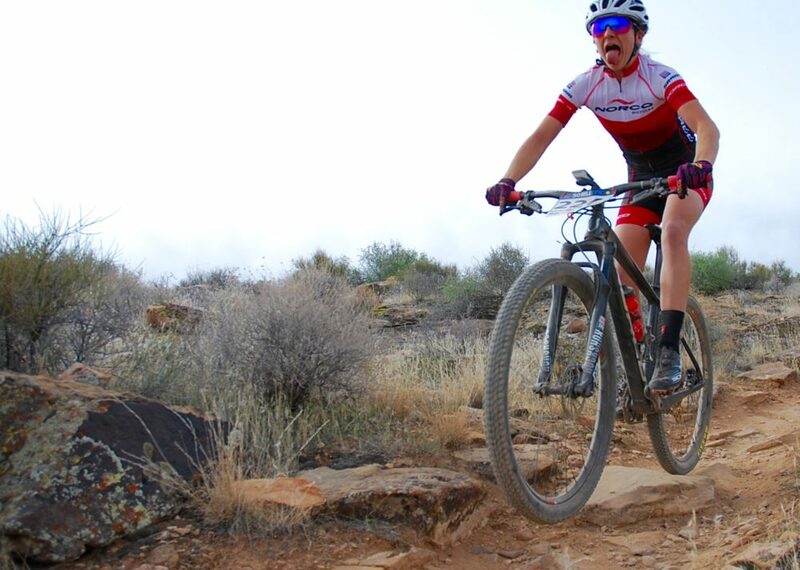 I had so much fun on the first lap riding all of the trails, especially More Cow Bell and Perma Grin. Rick’s Basin was beautiful. One guy was following me close the whole time but he never got by. Coming out of the North Woods, on the last push in Rick’s Basin over Snow Drift, I saw Karen Jarchow creeping up on me. As we came through the start/finish, the announcer commented on how strong I was riding, and then realized Karen was right behind me! I quickly grabbed my other camel back and jumped on the single track right in front of Karen to head out on the second lap. She stayed close for a while, and I pushed where I could up the mountain to try to gain a gap. Peaked trail was TOUGH that second time. I stayed steady to the top though and didn’t see Karen by the time I got up there, continued to keep my cool on the descents, and push where I could through the rest of the race. One guy finally passed me on the road, a few others tried, but I stayed ahead of them to the finish. Twelve minutes later, NUE defending Marathon Series Champion, Karen Jarchow, Team Topeak Ergon, took third at 6:19:07. Jarchow is also the reigning Fat Tire Champion. Pond defends last year’s win! 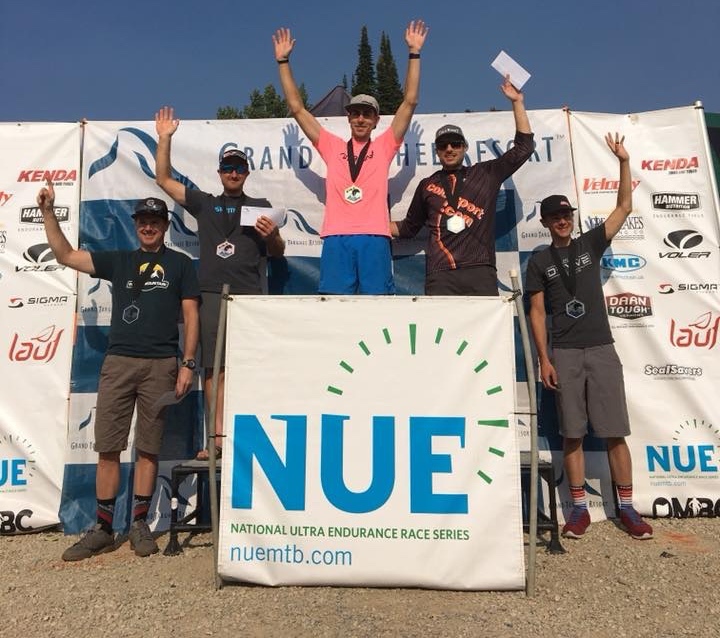 Defending NUE Marathon Series Champion and 2016 Pierre’s Hole race winner, Alex Pond, Steamboat Velo, earned his second straight win at Targhee to finish 5:26:17. 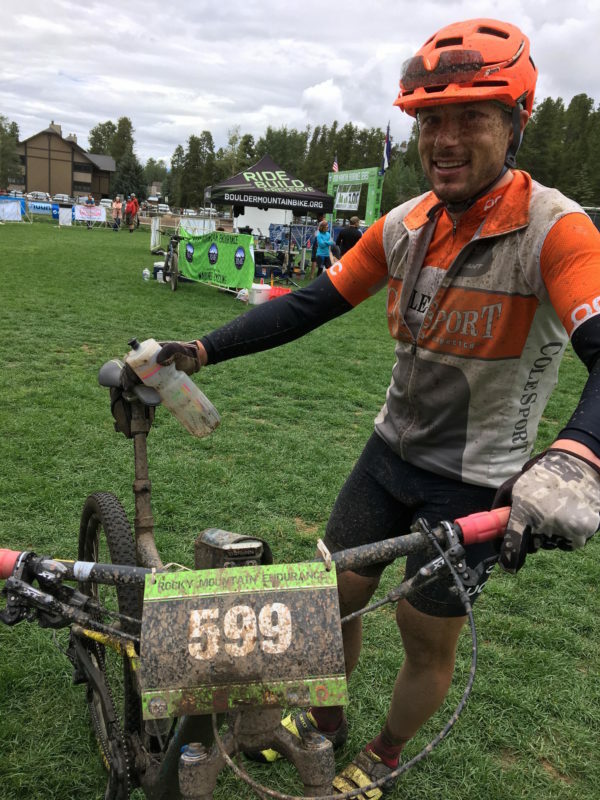 This was Pond’s first win of the NUE Race season since his fifteenth place finish at the season opening True Grit Epic in March. “From the start, I found myself watching a handful of riders pull the front of the group up the first road section until I got my legs spinning and, just like last year, went for the solo lead out over peaked and into 38 special. I definitely paid for the hard effort over the climb because slowly going through Perma Grin and Quackie Ridge, two riders were reeling me in pretty quick so I made the decision to let off a little, get fueled up, and battle it out over the second lap. The three of us made a quick pit stop before the climb back up and Matt Turner of Competitive Cyclist got the lead out, so I settled into his pace and waited out the climb with a local Jackson rider, Davey Mitchell, on my tail. Before we reached the top though, the race started to get interesting. The local from Jackson made a hard attack over Peaked Trail while Matthew started to fade and I was stuck in the middle, knowing if I went any harder over the climb I would blow up, so I let him go and saved it for the last 16 miles. I made contact with Davey on ski hill road and could tell he was paying for the hard effort at 9000 feet. Before we hit the next section of singletrack, I made an attack and, the next time I looked back, Davey had dropped off. I rolled past my bag drop, grabbed a fresh bottle, and headed out to Perma Grin for the last time. The climb felt slow and I was sure that I would start seeing other racers making gains, so I kept my focus forward, didn’t go over the top, and rolled in with a comfortable lead over the next competitors. Twelve minutes later, Matthew Turner, Competitive Cyclist MTB TEAM, was second at 5:38:37. Ten minutes later, Justin Raynes, Owenhouse Cycling, was third at 5:48:06. Twenty-Four minutes later, Nathan Collier, Pedal Pushers KIND Racing, finished fourth at 6:12:54. “The Pierre’s Hole 100km has been on my bucket list for years. Due to the race location’s distance from my home, I never thought I could make it happen. It wasn’t until a last minute family trip, planned in early June, that I could get off work, and luckily there were still spots open. I showed up on race day with one goal — finish. I knew the race would start with a big climb, so I made sure to extend my race warm up so I was ready to go. This paid off since the race started out fast. The first half of the race, I pushed harder than what I knew I should, but I just couldn’t help myself with the abundance of outstanding trail the Pierre’s Hole had to offer. I paid for it late in the first lap but, as an experienced endurance athlete, I knew that if I kept up with my fueling it would pass. By the time I finished the first lap, I was ready to attack the climb to start the second lap. It hurt, but I was able to push up the climb while still maintaining some clarity for a big descent down to Ski Hill Road. More amazedly, I still some gas left for the road climb as well. Larrabee earns the W and gets second overall! Cory Larrabee, Kuhl, earned his first NUE SS win this season at 5:33:44 using 32×20 gearing, second overall behind Men’s Open winner, Alex Pond. “Pierre’s Hole 100 has now become somewhat of a tradition with me and my support crew of five kids and my wife Amber. This year I decided that the third lap on the 100 miler kinda ruined the fun factor so the 100K was for me. I knew the competition would be great with George Flynn in the mix in the single speed category. At the start, George was climbing strong and was twenty seconds up on me and a couple other ss riders. At the road climb, George continued to hammer and I was not able to get on his wheel. Eric Melson went up and rode with George and I was again 15 seconds back. On the loop out on the north of the resort, I passed Eric and set my sights on George. I would see him a switch back up from me but could never close the gap. At the aid station, I stopped to get bottles and fuel from my amazing crew and rode through the start/finish. Going up the hill toward the single track, George was there refueling. We rode together for almost the entire peaked climb and I kept thinking that this could get interesting if neither of us fades. At the road climb, we both refueled and were heckled by the Fitzgerald Cycling crew at the aid station. At the top of the road climb, we passed another geared rider. Then, going into aid 2, I looked back and didn’t see George. At this point, I thought I had better do what I could to maintain the gap. Just after the aid, I passed another geared rider and was curious where I was in the field. No reason to worry about it I continued, knowing that I had approximately 10-15 miles left. Five minutes later, George Flynn, finished second at 5:38:28. Sixteen minutes behind Flynn, Shannon Boffeli, MTBRaceNews, was third at 5:54:11. 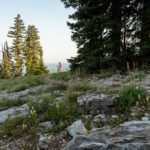 “My race started off a little slower than I would have liked as Corey, George, and Eric took off as we headed up Peaked Mountain the first time. I was riding 34 x 21 Rotor elliptical gearing, which I felt was the right gear for me but may have made the first climb a bit tougher. By the time we hit the descent, I couldn’t see the three leaders but I was feeling pretty good and having a great time making my way through the singletrack at Pierre’s. This race has such a great collection of trails it’s always one of the highlights of my season. The second time up Peaked I could see Eric again just a couple minutes in front of me and, by the top, I moved into third but he quickly passed me back on the 38 Special descent. I stayed close and, by the time we started climbing again, I was close enough I could move past and open up a solid gap. David Harris, LW Coaching, wins the Masters division at 6:03:27, more than a half hour ahead of his nearest competitors. Thirty-five minutes later, Ben Alexander, Team Rockford, was second at 6:38:34. Six minutes later, Tim Walker, Non Stop/Sierra Cyclesmith, was third at 6:44:26. 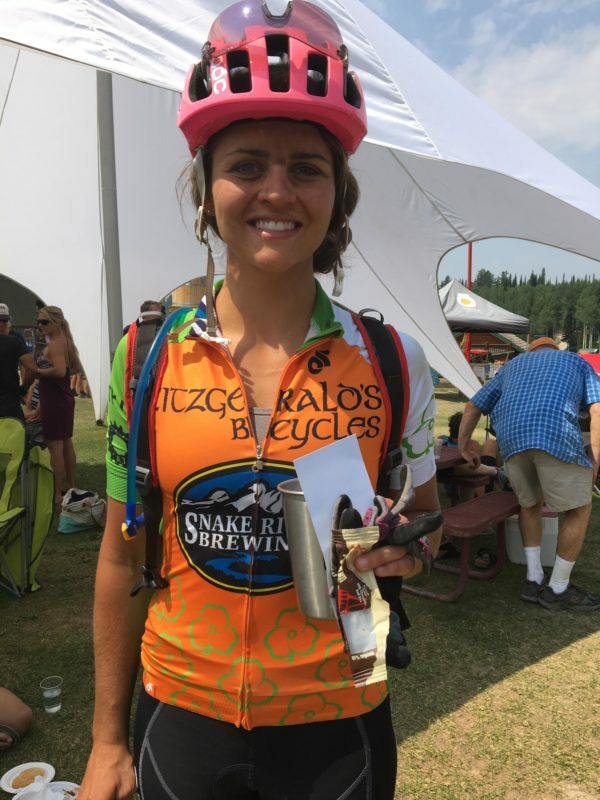 “After pre-riding the course on Thursday, I thought this course and elevation suited me perfectly. At the start, I was eyeing who my fellow 50+ races were. I started out pretty fast but kept within my zone. About ten riders went super hard and I figured they were all 40+ racers. Going onto Peaked trail, I was behind one guy with gray hair (definitely in my class). He was going really fast but I was wondering if he could keep that pace. He didn’t. Starting down 38 special, I kept my speed up with pushing too hard. Went right by the first aid station and started up the paved road. I didn’t know what place I was in but figured I was at least top three. One 50+ rider passed me up the hill and I went by one also. As I hit the section in Rick’s Basin, I was still going strong. At the start of the second lap, I picked up my camelback (the first time in 30 years of racing I used one). Just as I left, I heard the announcer say that fourth place was right on my tail. It was time to get going! Going up Action Jackson and Buffalo Soilder, I kept the pace as high as I could and kept a gap to fourth. I rode steadily up to the top of the course and down 38 Special. On Mill Creek, fourth place caught me and put a few seconds into me by the aid station. I lubed up my chain, asked a volunteer to pour water down my neck, and I was ready to go. Fourth place was still there and I joked to him that he could take as long as he needed eating. I was beginning to feel the effects of the race and needed as much time on him as possible as he was riding really strong. By the top of the road going into Jolly Green Giant, he had caught me and slowly pulled away. I never saw him again. So I’m thinking now, I’m in fourth and just have to keep the legs turning to stay on the podium. I was riding a little bit slower than on the first lap but kept sipping on the CarboRocket and kept pushing towards the finish. About a mile from the finish, Jeremiah Bishop blasted by me leading the 100-mile race. I was happy to finish in fourth until, about thirty minutes after I finished, I saw that I was actually third. The guy that passed me going up the road on the first lap was vaporized on the second lap and carded a dnf. Overall a great race course and organization. Put this race on your “Must Do” list. My first Marathon podium and I am looking forward to the Grizzly 100k race in Big Bear. Just one minute behind Walker, Brian Ressa, Utah Mountainbiking.com, was fourth at 6:45:40.